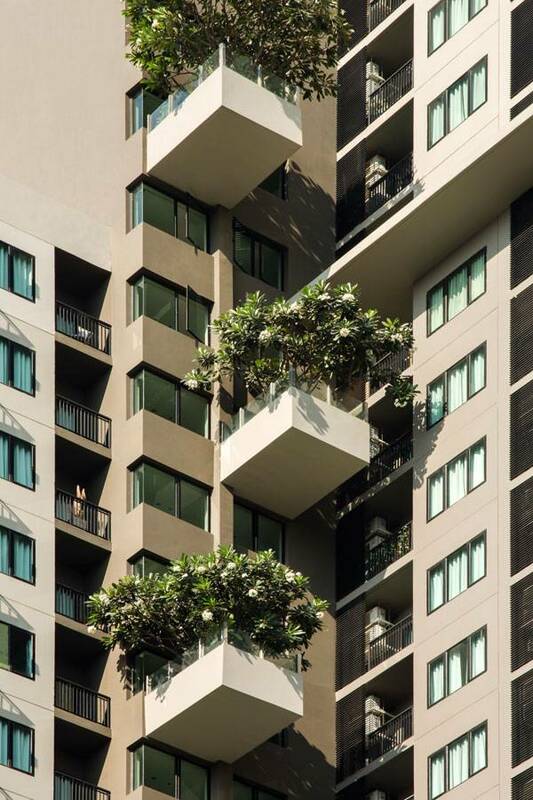 Article by Eleni Tsirintani – A review of the Blocs 77 Condominium project, designed by Shma, in Bangkok, Thailand. Sometimes the given limitations of a project are hard to cope with. 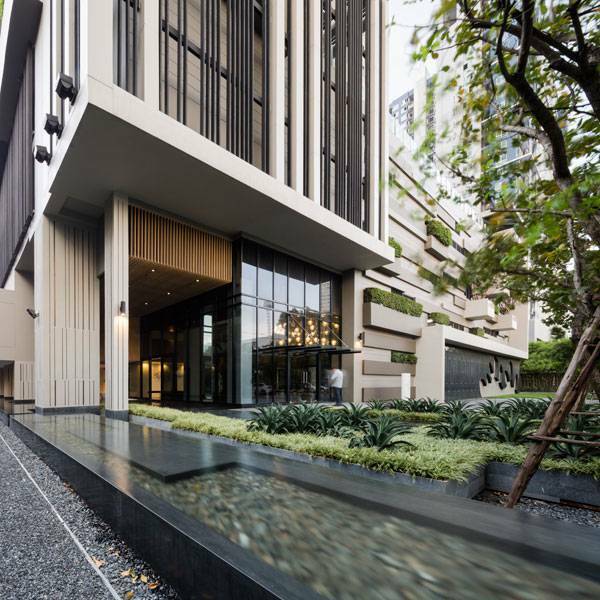 In the case of Blocs 77 Condominium project, that meant 5,244 square meters, 467 residential units, compulsory construction of a six-meter-wide fire engine route, parking lots on the ground level, a high-rise building, and the city of Bangkok, Thailand. 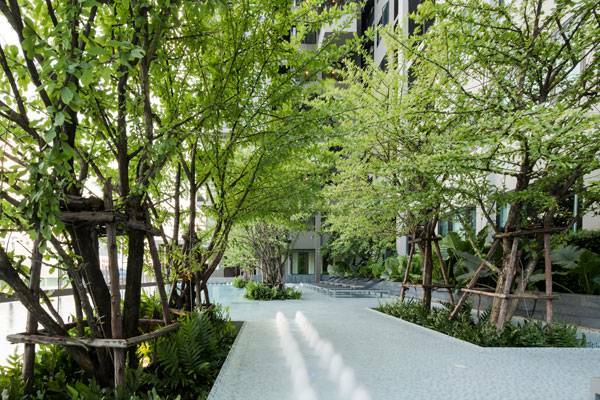 Taking into account all of the above, the landscape architecture firm Shma had to come up with a landscape design to address the needs of residents, connect the condominium Blocs 77 with its surroundings, and create a connection between the condominium garden and the adjacent canal. 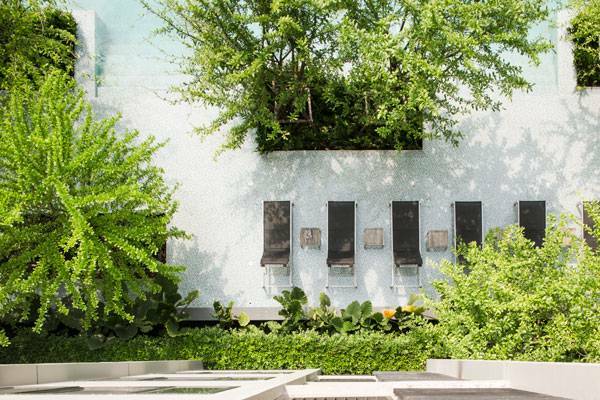 How Baan San Ngam Takes its Inspiration From Nature”. The tree canopy has been used as a metaphor to adapt vegetation in the horizontal and vertical sense. Expanding the concept of canopy toward every available dimension has an ecological aspect, as well. The built volume dominates its overall tight site and neighbors. The compact building increases heat and glare reflecting from the condominium into the surrounding context. The landscape intervention softens the impact of the new high rise with the use of extended hanging planters on every floor. The design approach brings nature closer to the inhabitants of Blocs 77, maximizes the area of green spaces, and minimizes the impact of the heat and glare that the building façade could cause. The location of Blocs 77 places the intervention between two areas of public interest. There is the adjacent, peaceful area of the canal on one side. 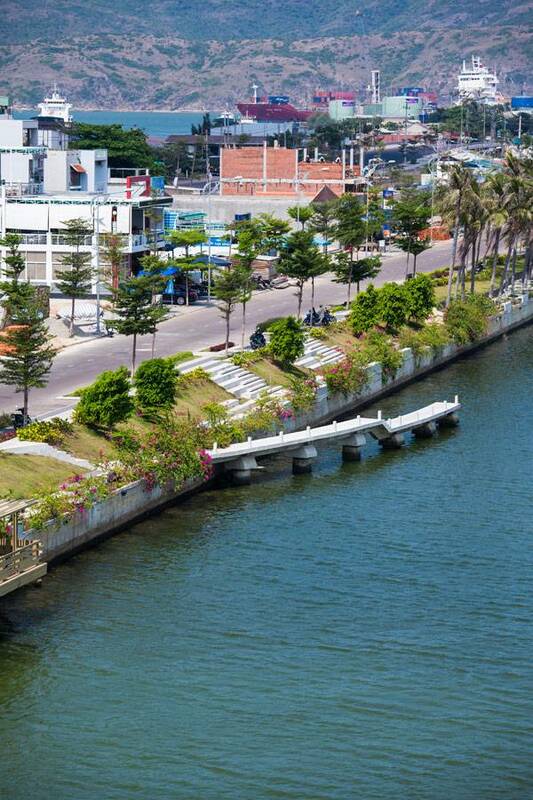 This is a special ecology in terms of vegetation, as well as the water level variations that demand a careful handling of the area toward the canal. On the other side is a busy street, with traffic congestion all day and an area full of shops, houses, and a shopping mall. In order to improve the area in front of the condominium entrance, the design team has placed a fence within two meters of the site boundary. This creates a green buffer zone in front of the project that protects the entrance from the street and creates a welcoming frame for residents and visitors. 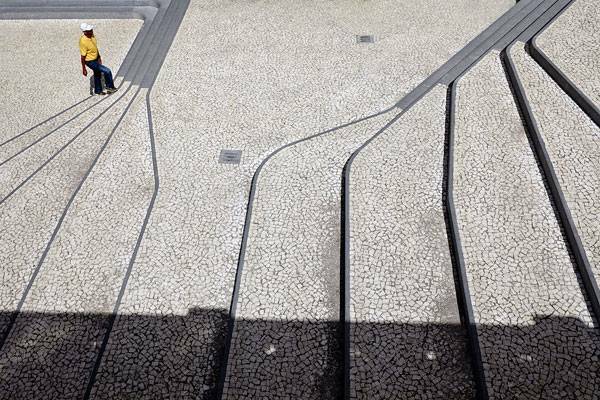 Shma has approached the transition between public and private spaces with great success in other projects, as well. To learn more, check out the Landscape Architects Network article: “How a Narrow Piece of Land Evolved Into a Luxurious Project”. 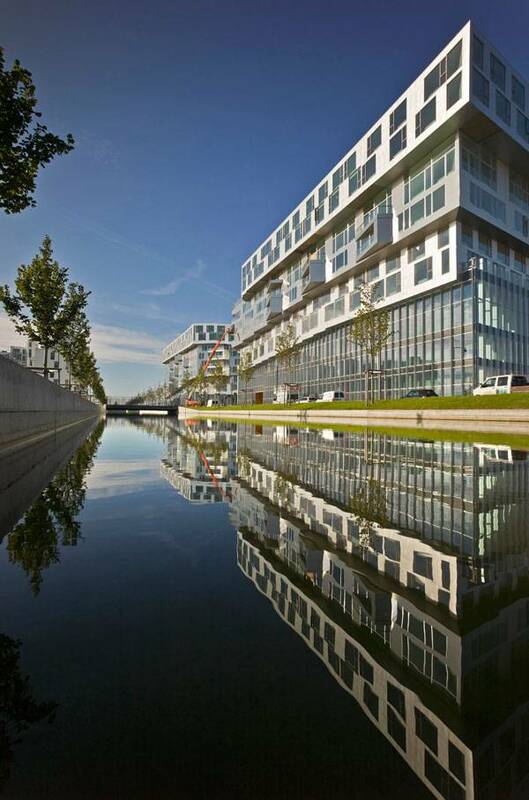 On the other side of the complex lies the canal, which requires a different design approach. 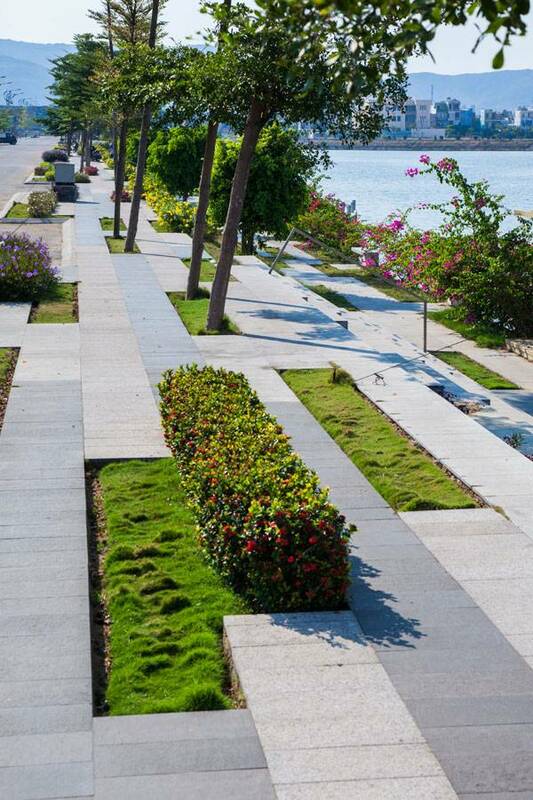 A garden has been developed along the water’s edge to create a sense of continuity and allow for interesting views toward the water. The species selected for the planting scheme are adequate for water-edging planting. In order to protect the new plants from the rise of the water level, all planting beds have been placed higher than the initial ground level. An extended deck surface accommodates relaxation and seating areas in the garden. The deck surface unfolds toward the planted areas and forms fixed seats under the shade of trees. The adjacent canal creates a sense of fluidity and underlines the presence of nature in the project. These merits expand within the site boundaries, where water is also present in different forms and functions. 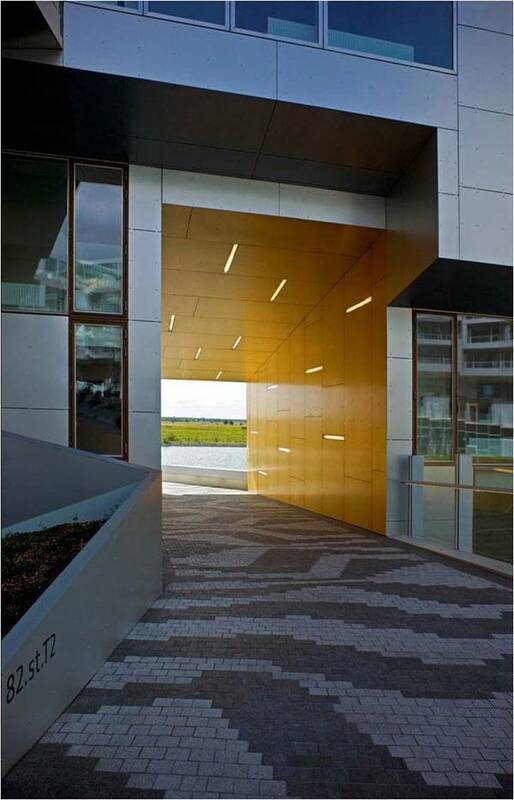 A linear water feature invites the visitor toward the complex entrance. The water is surrounded by lush yet thoroughly organized vegetation. 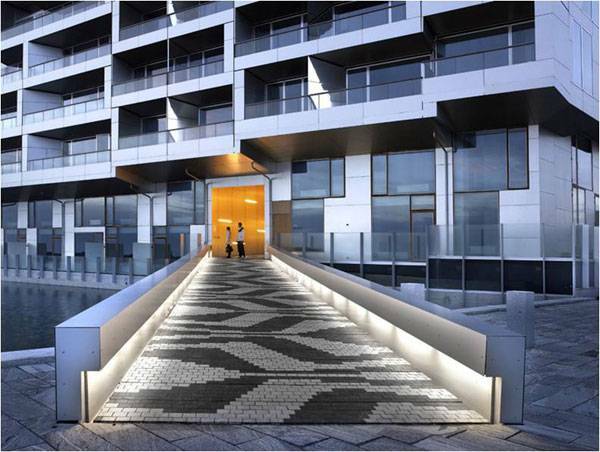 Geometric surfaces paved with dark gravel pay tribute to Oriental gardens and still maintain a contemporary character. There is a swimming pool on the fifth floor for the complex residents. The pool water is light blue and inviting. 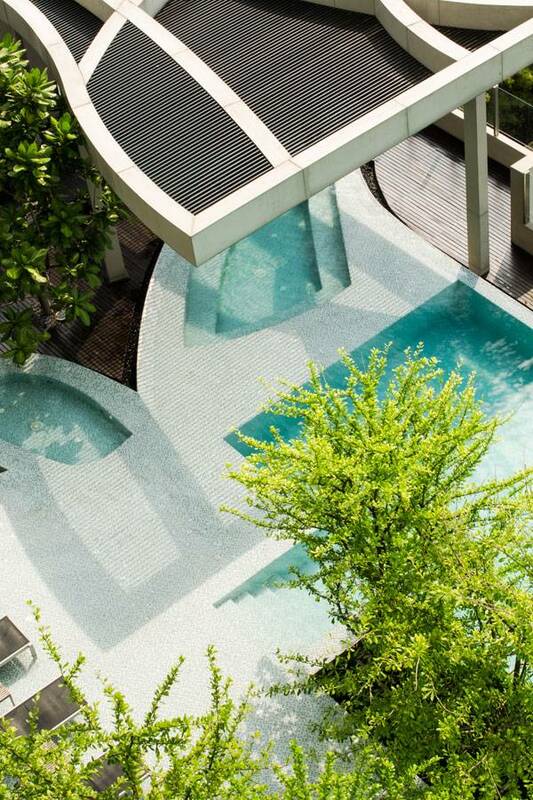 One can enjoy different spatial qualities related to water, such as a spa pool, a play pool, and the pool terrace, which is also slightly submerged into the water. The pool paving expands toward the adjacent areas, maximizing its size. All these variations are accommodated under one single water surface. This is what makes the pool look wide and is a dominant element on the terrace. 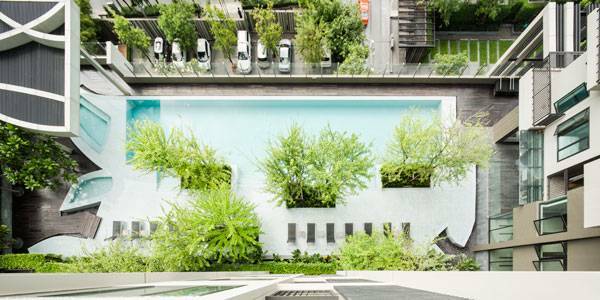 The adjacent pool planters bring nature even closer to the inhabitants and form shaded and protected spaces for relaxation and socializing. Landscape projects such as this make it obvious that there is a landscape everywhere — no matter what the urban density is, how many restrictions there are, or how hard it may seem to make things work. 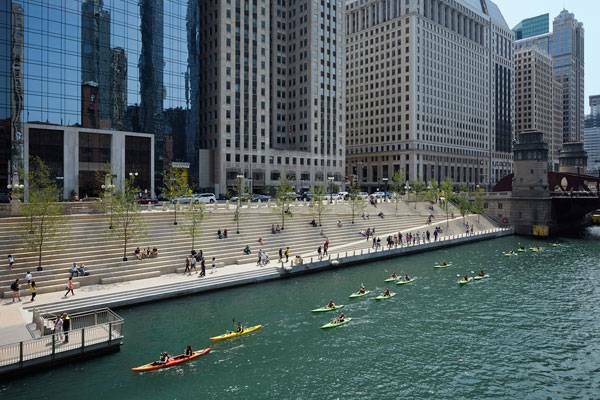 The economic circumstances, the rapid expansion of cities, and the urge to accommodate more amenities in less space has become the new challenge for landscape professionals. We have come to an era in which our scope of work is not only about handling and designing landscape, but about having to invent landscape, as well. Fortunately, new technologies such as green roof infrastructure or green wall planting make it feasible to develop landscapes in places where it would not have been possible before. 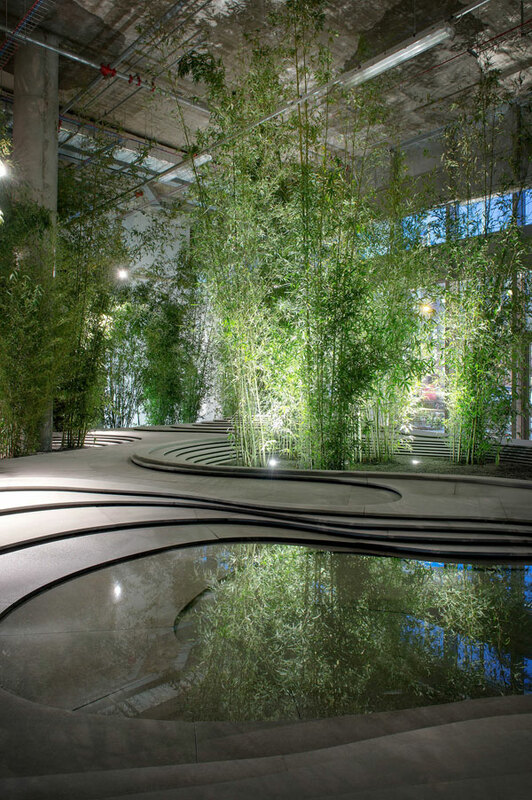 Article by Eleni Tsirintani – A review of Naturescape by Kengo Kuma And Associates, in Area Porta Nuova Varesine, Milano, Italy. Landscape is about open-air spaces…well, most of the time! Naturescape, by Kengo Kuma and Associates, has been created to challenge this concept along with other preconceptions regarding exhibition spaces and architectural temporality. 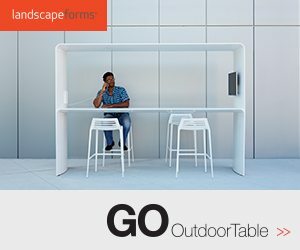 How could a landscape be developed indoors? 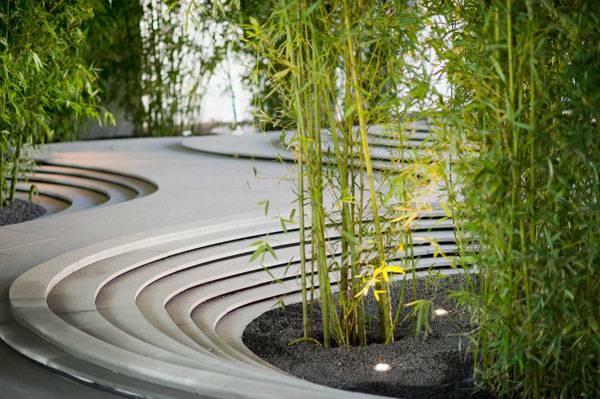 How can Japanese garden principles apply in contemporary design space? Can one enclose natural elements in a room? 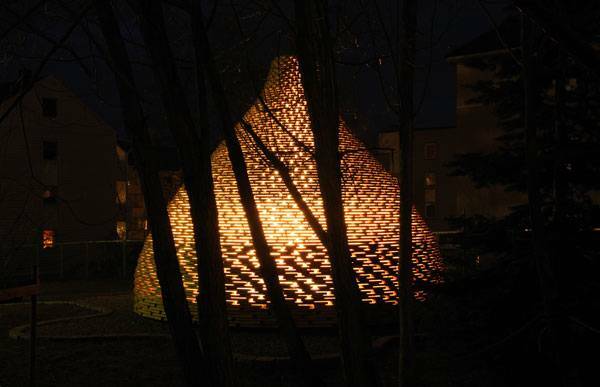 Naturescape was been commissioned to KENGO KUMA AND ASSOCIATES for the 2013 Salone del Mobile, in Milan. It functions as a showroom, but not like any other you have seen. The space goes beyond the typical display of objects providing an almost transcendent experience on landscape, architecture, and design. The architect introduced the tradition of the far east in the design process. The space draws inspiration from the clarity and simplicity of traditional Japanese gardens and still manages to retain its own conceptual integrity. Traditional Japanese gardens are known for their minimalistic design and their rich spiritual meaning, the clear yet fluctuating geometry, the combination of natural elements that, though integrated into the design, preserve their individuality. Japanese gardens have, also, very clear and defined borders but give the sense that they could expand to infinity. Kengo Kuma grasped all these merits and dipoles, which gave him the necessary design tools to conceive and create Naturescape. The installation room area is 323m2. 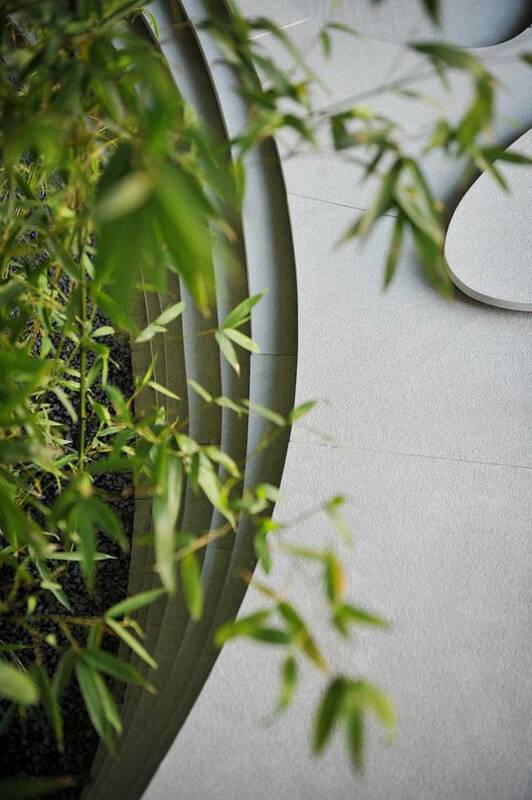 An organic, curved form made of pietra serena shapes the new topography. Layers of organic curves sculpt a mild leveling. The leveling variations accommodate the water and planting surfaces. Like in landscapes found in nature, the new terrain has been perceived as shaped by the water’s presence and movement. The project’s authors express this concept in a quite poetic way: “Water is a powerful sculptor, Stone is a patient matter. Water can transform even the hardest materials into soft and gentle… but the stone is the one to trace the path. Topography is a long story between two opposite elements that together shaped our world hosting the occurrence and evolution of life making this world become the precious garden we live in.” The new topography allows for exhibition and seating areas to emerge around it. 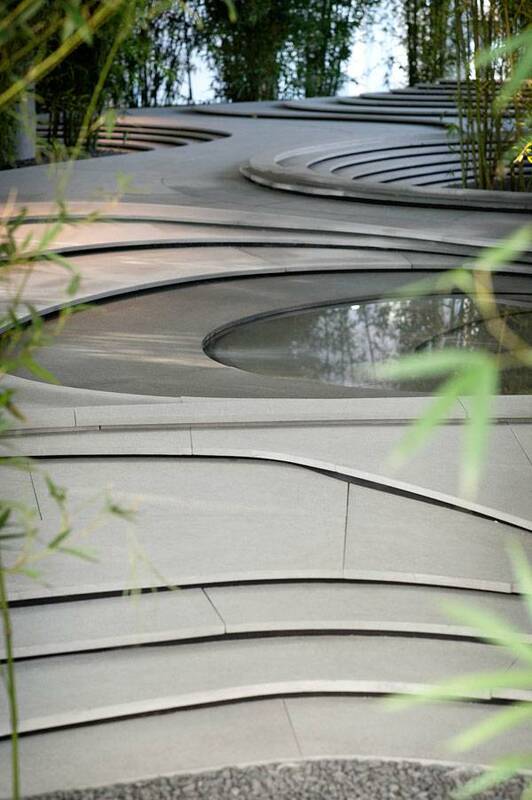 The organic shaped surfaces are paved with gravel. The visitors is guided there through paths constructed from stone slabs. The succession and blending of materials creates a smooth transition from one space to the other. The areas are surrounded by lush bamboo clusters. The dense bamboo plants form a green screening that gives a sense of privacy and allows for permeability and transparency at the same time. The exhibition and seating areas revolve around the topography and are not revealed to the visitor right away. This urges the need of wandering and exploration which is a very unique garden quality. Bamboo (Phyllostachys spp.) are tall, slender plants. 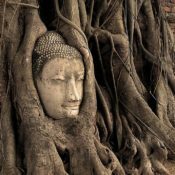 They come from Asia but they thrive in most parts of the world. They have large water demands, thus their presence supports the important role of water in the project. Bamboo creates the sense of expansion and blurs the limits of the container/room that defines the project area. 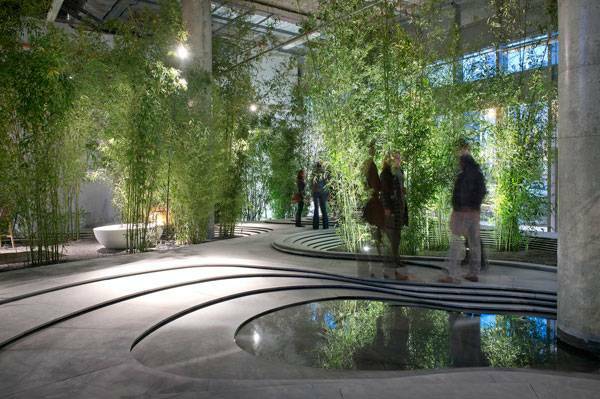 The landscape architecture studio Frassinagodiciotto was responsible for the vegetation design and did very well in creating a forest-like, green space. It does not happen very often, to encounter an interior space with the qualities of an actual landscape. The success and high quality of the project lies in the fact that it never tried to imitate nature, nor represent it. It went beyond depiction and scenography. 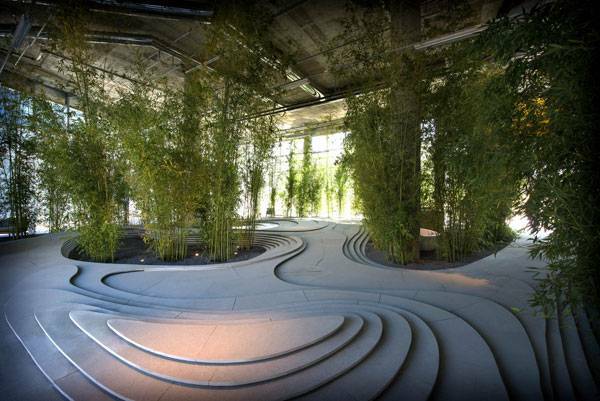 Kengo Kuma and Associates understood deeply the essence of Japanese gardens and the qualities of landscape. They acknowledged them and took them to the level of interior architecture, without diminishing or undermining them. The line between representation and interpretation is very thin. Blurring the boundaries between interior and exterior space could and has often led to ridiculous results. This project is not the case. Naturescape is exemplary in terms of concept, design and realization. Would not it be great if architecture and landscape architecture merged so successfully in every project? Certainly, we all share the opinion that it would; as professionals we should see that it does happen! 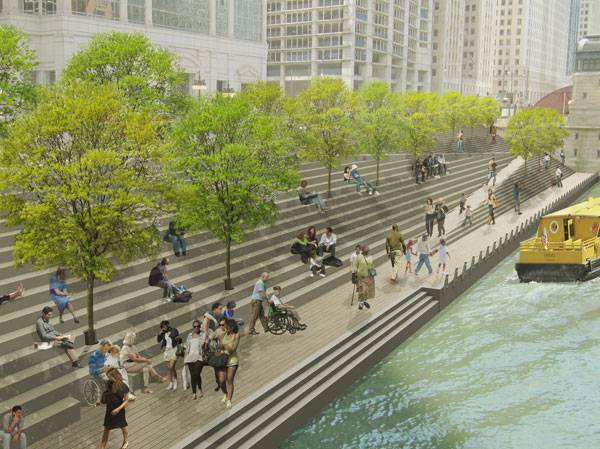 Article by Eleni Tsirintani – Chicago Riverwalk Expansion, by Sasaki and Ross Barney Architects, in Chicago, IL, USA Chicago Riverwalk Expansion by Sasaki and Ross Barney Architects is a contemporary Urban Design expanding towards the Chicago River Edge developing different functions and landscape typologies that enhance the identity of the contemporary city of Chicago. The project is the expansion of a similar intervention completed in 2009 by Ross Barney Architects. The earlier work includes important city landmarks like Veteran’s Memorial Plaza and the Bridgehouse Museum Plaza. The idea is very simple and brilliant, like all great ideas. Reclaim the space along the water edge and connect the city to the river. A task that is easy to envision, but hard realizing. However, as Gina Ford, lead designer in Sasaki Architects puts it: “If you can imagine it, you can build it” and so they did! The intervention surface unravels along the riverside creating five distinct areas. 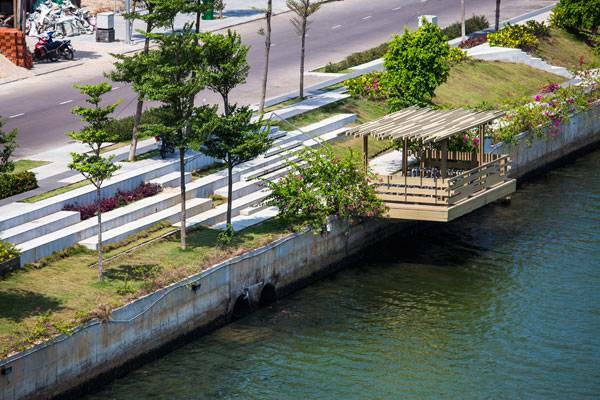 The areas are divided by the existing circulation bridges and they connect with the Boardwalk: An accessible walkway and a new marine edge at the same time. This is a space resembling the typical city plaza; only it is open towards the river and its’ activity. 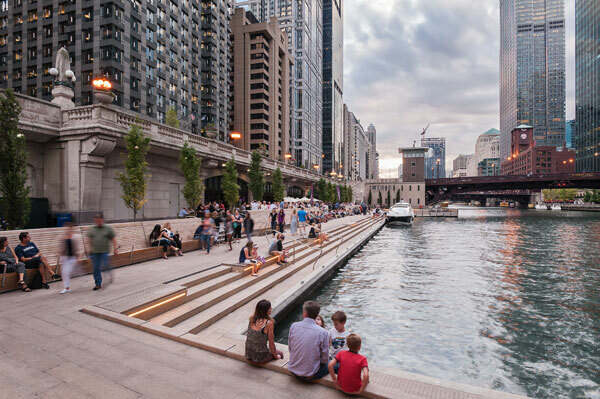 Restaurants and outdoor seating areas provide views towards the vivid human interaction on the water surface, including passing barges, patrols, water taxis, and sightseeing boats. An enclosed, protected area for Kayak rentals and docking for human-powered crafts. 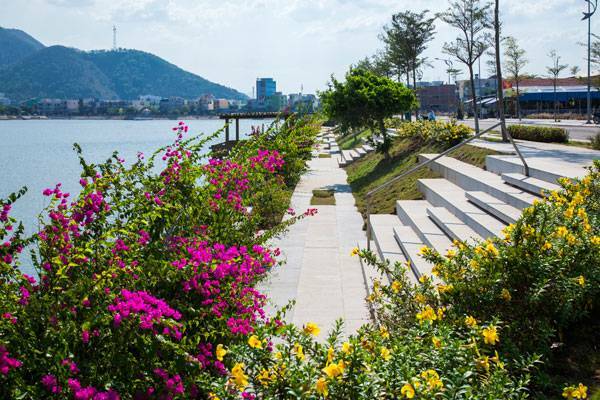 It offers the space for recreational activities relevant to the river and allows easy access to the water. 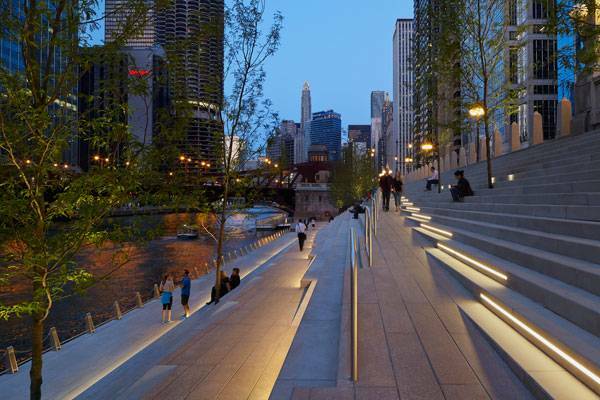 A sculpted slope made of ramps and stairs connects Upper Wacker and the Riverwalk. 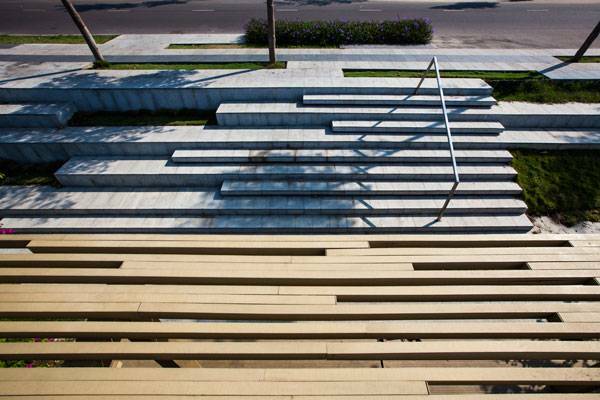 This wide, public staircase offers pedestrian connectivity to the water’s edge and allows for socializing and reverie under the wide shade of tall trees. In this area water penetrates the edge between river and land. It actually enters the intervention and becomes the key element. 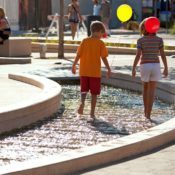 A water feature offers the opportunity for children and families to engage with water at the river’s edge. Experiencing water as part of experiencing space creates a new perception for the river. 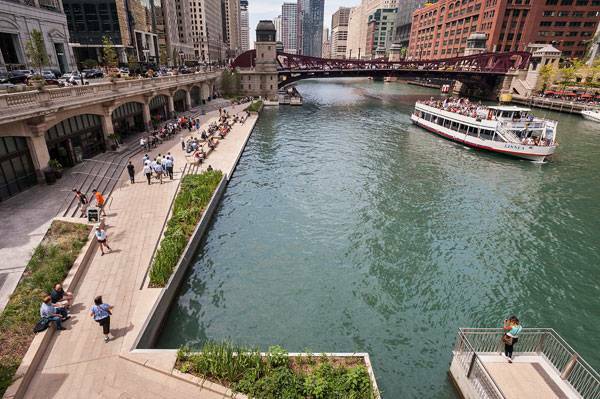 It transforms the river itself to a familiar, vivid part of the city. The clear boundaries between the five areas created the necessity for a powerful idea that would unify and connect them in conceptual level. The backbones of the intervention are materiality and geometry. No matter how different each area is the material selection and the design philosophy bring them together into one coherent result. The lines are clear and develop along the water edge forming a sense of continuity and fluidity. 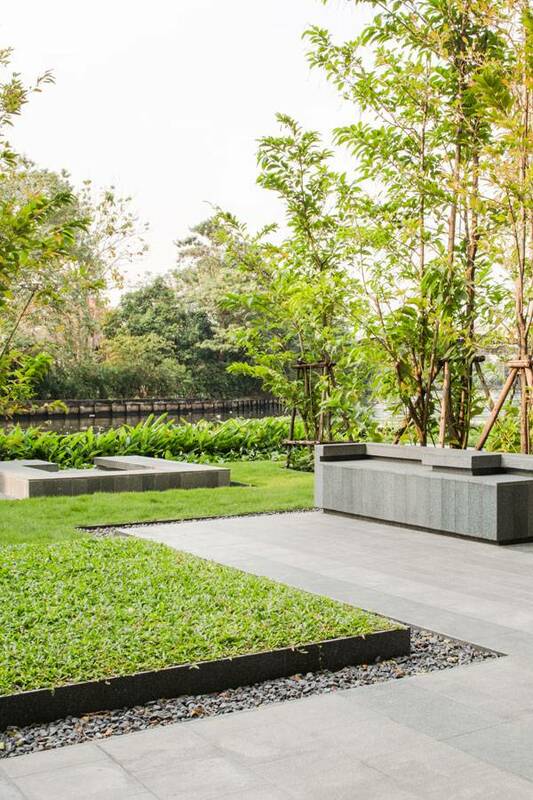 The wooden seating areas unravel along the water edge according to the functional necessities and the stone paving forms different levels in order to create proximity towards the river. 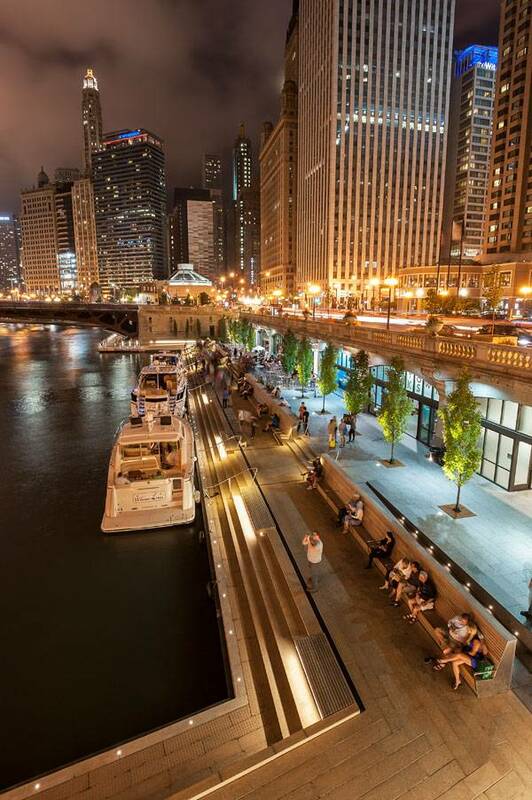 The impetus for such an accomplishment derives from a wider vision regarding the city of Chicago. 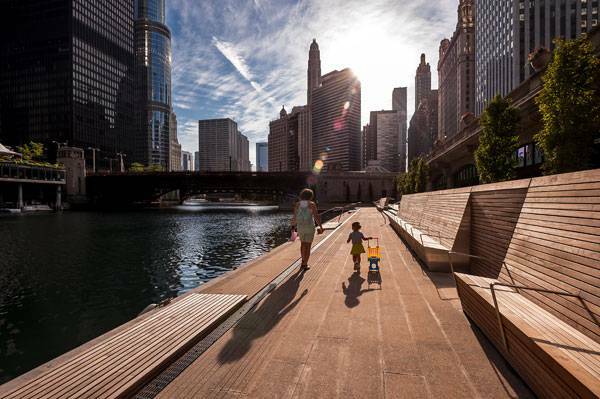 Chicago is being reinvented in terms of urban identity and further development. It aims to become a better place to “Live, Work and Play”. This phrase indicates the intention to create a city better for the citizens with equal care regarding functional and recreational aspects of city life. The project aspires to cause a certain financial, social and cultural impact on the city life. The economic return of an investment of this size is crucial. 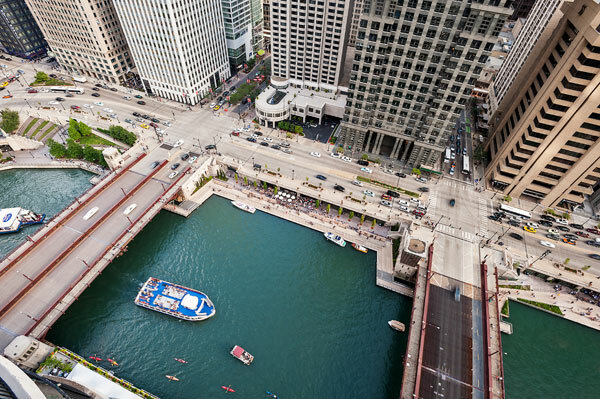 The increase in property values, further development in boat operations, businesses looking to invest or relocate in Chicago are some of the obvious benefits. Another important side of the project is working with natural elements. The ecological aspect has been thoroughly considered and developed, as it should in all landscape projects. There are certain design decisions that allow for incidents like inundation and water level changes to integrate to the project without alternating it. There is a special consideration for the river flora and fauna in order to favor its’ survival and further evolution. Underneath the visible part of the intervention lies the infrastructure which helps aquatic life to thrive. Elements like limnetic habitat curtains, pole “hulas” and caisson mounted lunkers make the project friendlier for creatures other than humans that wish to enjoy the river. 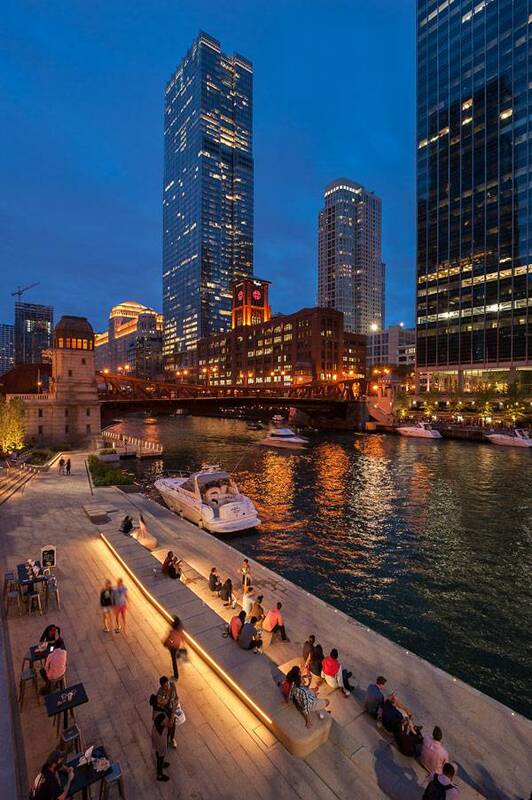 Given that the site lies in the heart of a dense part of Chicago with numerous skyscrapers, allowing for nature to evolve offers added value to the project quality. If you wish to learn more about waterfront design and how other cities work on the same issue check the article: “10 Cities That Are Reinventing the Relationship with Their Rivers” And also take a look at: “Australians Do It Better: Instructions for the Perfect Waterfront“ For a public space projects to develop it takes inspiration as well as vision, will and commitment from everyone involved. If you think it is all about design… think again! Understanding the characteristic element of each plant is important. It allows for the correct selection according to the specific parameters of each planting scheme. Aechmea fasciata is a beautiful plant with a symmetrical and rather architectural form. A large pink/red flower grows in the centre of the plant all year round. The flower is flanked by wide, light green foliage. The dynamic form allows you to keep it as an individual planting element in your interior space without further additions. It is suitable for container planting. Fortunately, you can maintain this plant in great shape with very little effort. It cannot stand direct light and it needs very moderate watering. 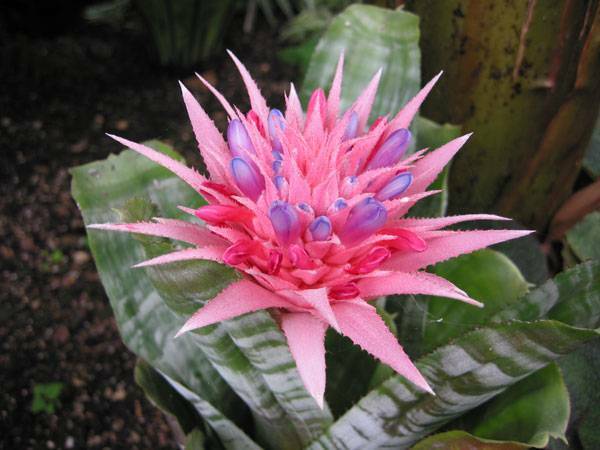 Your Aechmea could even reach one meter tall, when mature, and provide a beautiful element in an interior planting. This is a plant with both interesting foliage and impressive flowers. It is covered with vivid pink flowers from late spring till late summer. The flowers resemble small bells and they practically hang from the branches. 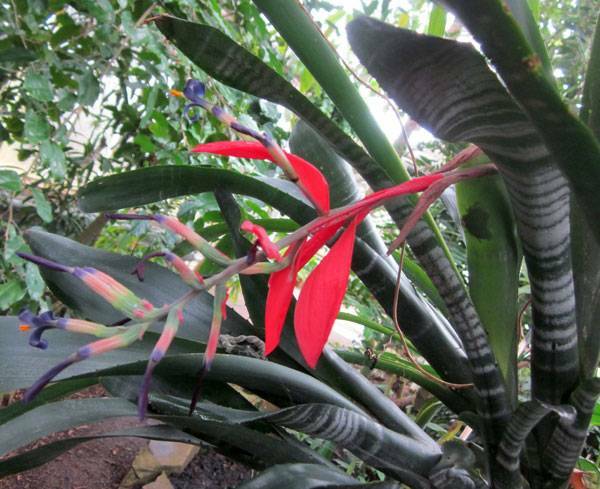 Billbergia nutans is beautiful when placed in a hanging pot or as a string garden element. To see how to achieve that, check the article…. 5 Ways to Integrate Planting with Interior Design The hanging flowers and leaves resemble a vegetated chandelier. The plant thrives in places with full sun and its needs for fertilizing are relatively high compared to other plants; however the abundance of flowers is worth it. 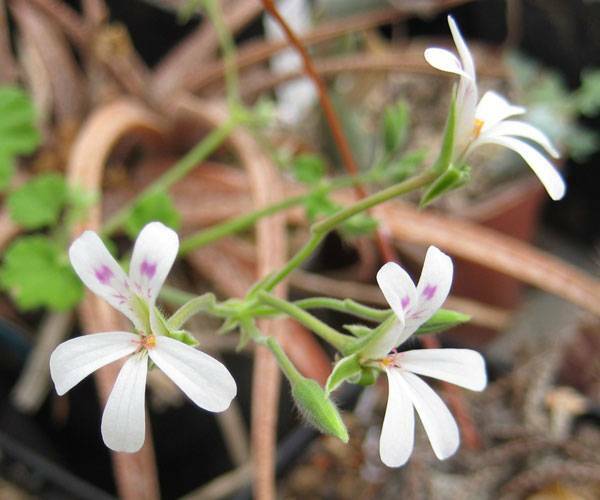 Everyone knows that Pelargonium thrives everywhere and under the most difficult circumstances. They are a good choice when you require a robust shrub, covered with flowers most of the time and followed by a beautiful scent. They are great for culinary use and they have very low demands for maintenance and watering. Keep them in a sunny, well-ventilated place and you will be rewarded with a beautiful addition to your interior space all year round. Flowers are beautiful, there is no doubt about that. 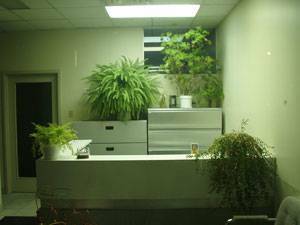 However, there are plants that are great for planting indoors but they produce no flowers at all. 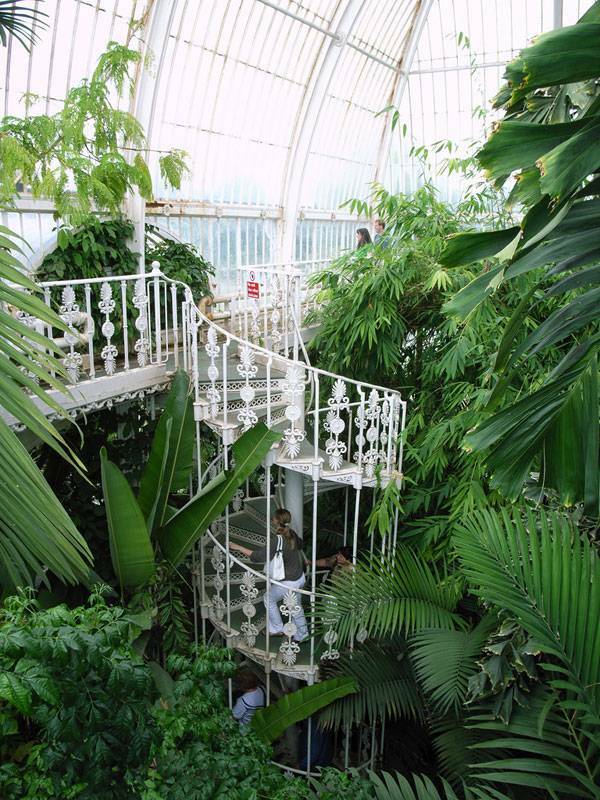 Their foliage is what offers them aesthetic value and makes them architects’ and designers’ favourites. 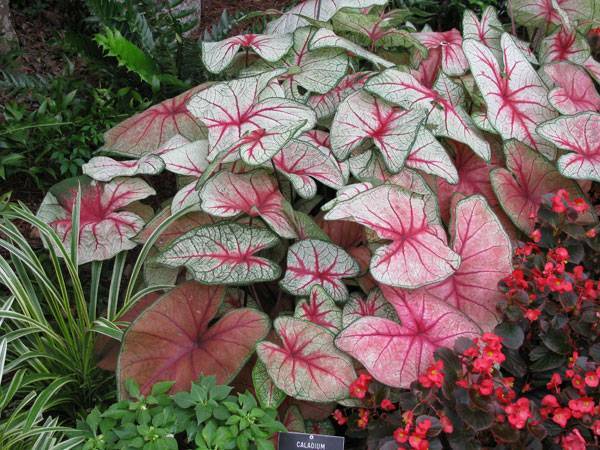 Caladium hortulanum is a beautiful groundcover plant… that is not green. Actually there are a great variety of colours in this plant, from light red to dark brown and black. The same goes for the variety of shapes of its foliage. Caladium hortulanum, once applied in a large surface, creates a unique, colourful pattern. They are hard to care for, because they require high levels of humidity and little sun exposure. They are great to combine with other species to produce a lush result and they could provide an interesting sub-storey level for trees with sculptural form. 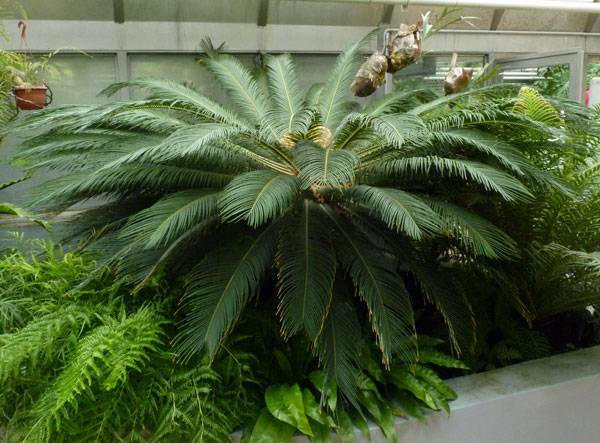 Cycas is a low tree, similar to a palm tree, with impressive, dark green foliage forming a crown over the trunk. The plant could be either a one-stem plant and become suitable for a medium to large container planting, or it could have 3-4 stems of different sizes creating a focal point for a lush plant composition. It is symmetrical and the leaves are dense, therefore it makes a great addition to a planting scheme. Cycads grow very slowly, so make sure you purchase the size required from the beginning and don’t depend on time! Lady palm is an elegant kind of multi-stem palm tree. The thin upright branches terminate in long, narrow leaves forming small umbrellas on the top. They are suitable for linear arrangements and creating screens for more privacy between spaces. Lady palms are easy to care for, so do not hesitate to include them in an interior planting scheme. Senecio rowleyanus is a true jewel in planting. As its common name reveals it is an actual “String of Pearls Plant”. 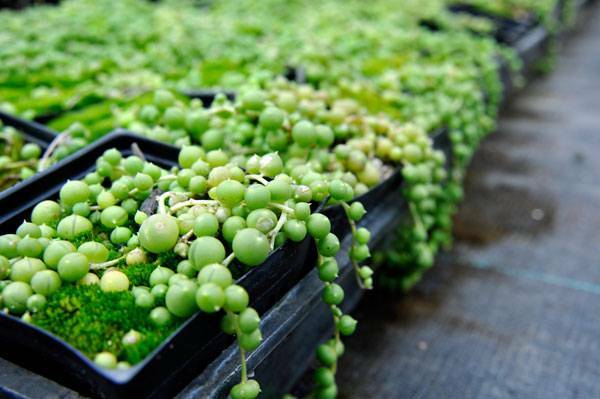 It is good for planting along the edge of a planter, to allow the pearls to float over the floor and cover the planter side or in a hanging pot, creating a waterfall of green “pearls”. When hung, it would be better not to combine it with other plants, in order not to lose the dramatic effect. Black Rose should not fool you; it is a succulent, not an actual rose! The black leaves grow around the plant stems. The plant flowers in winter with yellow flowers that create a vivid contrast with the dark foliage. When planted with others species the unusual dark foliage provides a background for the rest of the plants to emerge and create an impact. When planted alone it would be better installed in small planting beds or containers, since it does not become too tall. 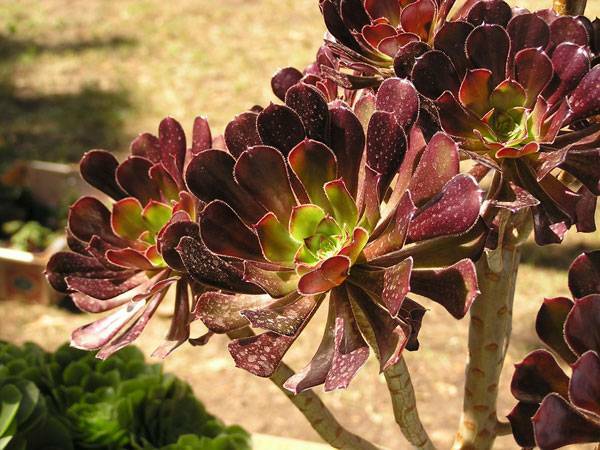 As with most succulents, it is very easy to maintain and it has very low water demands. 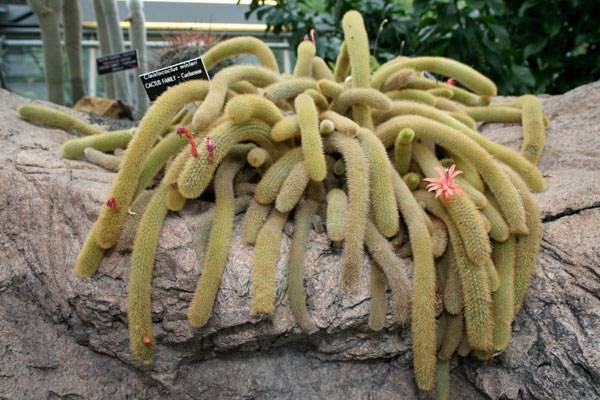 The Rat Tail Cactus is another species great for a hanging pot or a string garden. Its added value are the pink flowers that grow from many parts of its stems, for only five days out of every year. As with most cactus plants, Disocactus flagelliformis has practically no maintenance demands, so do not be reluctant to include it in your collection. What should be always considered is the creation of a planting scheme that is interesting, coherent and easy to maintain. No matter what species you choose, in order to accomplish a successful planting scheme indoors, read the article: 8 Common Mistakes in Interior Planting. Do you have any plant combinations in mind yet? Do you have anything to say about this selection of plants to plant indoors? Article by Eleni Tsirintani We explore 5 ways to integrate planting with interior design so that you can achieve optimal results and a sustainable planting scheme. 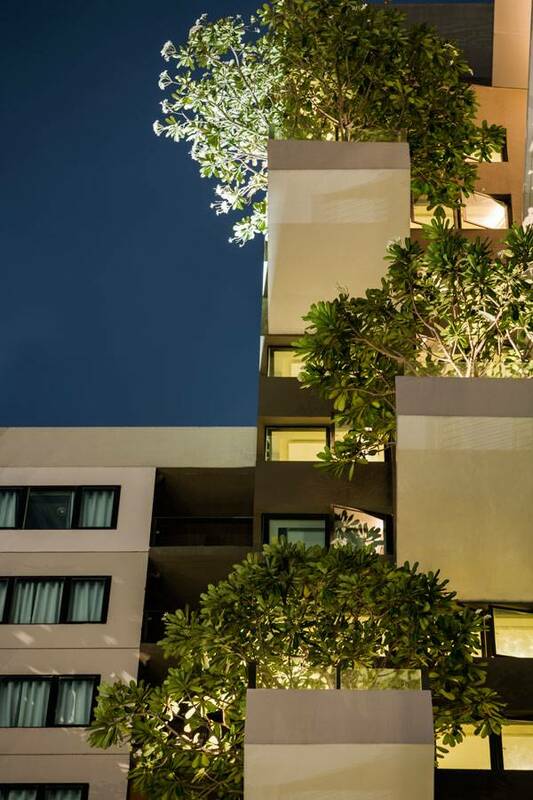 There is an increasing tendency in architecture to connect and integrate vegetative elements into designs. Green roofs and vegetated areas around built volumes become important ingredients in the creative process. The environmental benefits of this approach are great in terms of energy consumption, noise filtration, and air purification. Real estate assessment is also affected. The “greener” the approach, the higher the sales or rental prices are. Allowing vegetation to thrive indoors is an emerging expression of this tendency. This article presents five creative ways to incorporate plants with interior design. The advantages of each method are thoroughly analyzed, as well as what to bear in mind when deciding how to approach interior planting in every case. Built-in planted surfaces in architecture allow you to do practically anything in terms of planting arrangement. Plant big trees, have a large variety of plants providing a lush result, or create a living ecosystem from scratch. It can become focal point of the building design and provide great benefits in terms of air purification, working productivity, and aesthetic value. However, this is an approach that should be considered in the early stages of the design and building process. One should take into account all the infrastructure issues for a successful intervention, such as drainage, irrigation, light exposure, and ventilation. Plant selection should also be decided early on, since it would define both the planting bed depth and ceiling height. You would not expect a tree to thrive in a 20cm deep planter nor in a space with a 3m high ceiling. Would you? In order to water the hanging plants you should remove them and dampen the root ball in water. You should allow it to soak before placing it back on the string. If you consider planting indoors check the following article “10 Great Plants for Interior Planting”, which presents a selection of plants that thrive indoors. 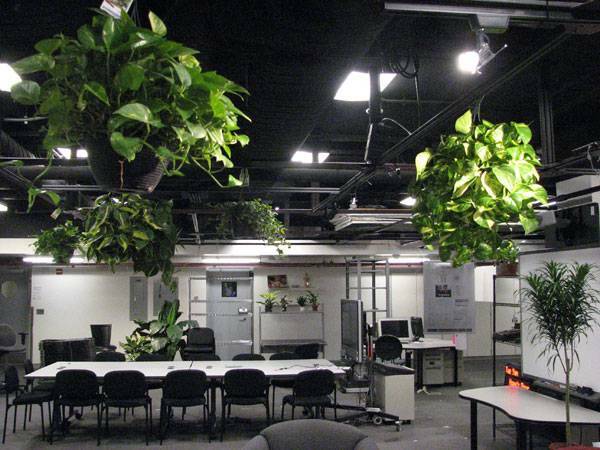 Interior space planting could prove a new field of experimentation and exploration for professionals and non-professionals. It could become the starting point where architecture and landscape architecture merge into one consistent and coherent result. Have you picked your method to plant indoors, yet? How to Let Nature In; 10 Amazing Suggestions of plants for interior planting for lush, vegetated, indoor spaces. Do plants grow indoors? Definitely Yes! Do all plants grow indoors? Definitely No! If you aspire to create an amazing indoor garden or simply have a pot on your desk, choosing the right plant is of vital importance. As argued in the article: 8 Common Mistakes in Interior Planting, “We could never expect a palm tree to thrive in Antarctica. Why should every plant grow indoors? Site specificity is a “must” when planting in an interior space.” This article presents 10 plants that grow beautifully in indoor spaces. There are several others that could be included as well. Plant selection depends on many factors whether discussing interior or exterior spaces. 3. Spathiphyllum wallisii Spathe flower, a flowering plant for indoor spaces. Spathiphyllum wallisii is a true life-saver. It adapts and grows easily providing a spectacular result in any case. It is a great choice for small and confined spaces since it could easily grow even in a small pot. On top of that it is a flowering indoor plant, with white or red flowers that offer special interest and beauty to the space. 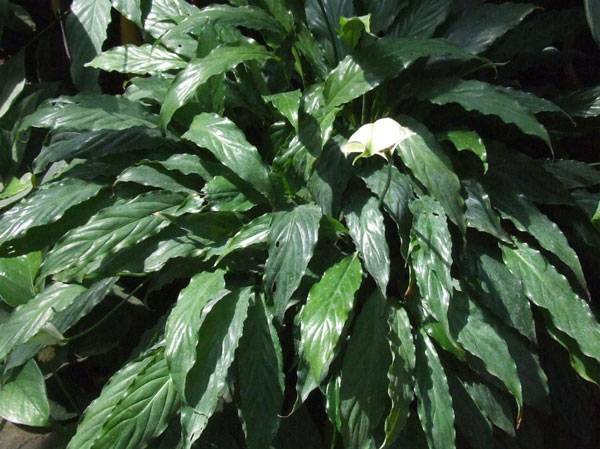 One of its hidden virtues is that Spathiphyllum wallisii is also an excellent air purifier. In this case not only you enjoy an amazing plant, but also a great improvement to the indoor atmosphere. 4. Caryota mitis Fishtail palm, a choice off the beaten track. Caryota mitis is a multi-stem palm tree with light green foliage. Fishtail palm is native to Southeast Asia. 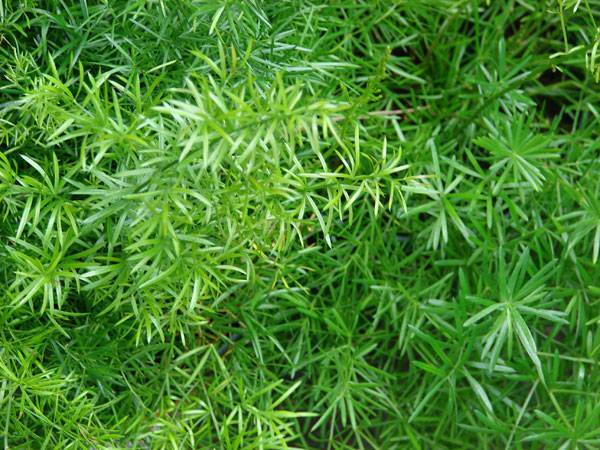 Its leaves look like fine lace or elegant fish tails, as its common name reveals. It is a very original choice if you love interior planting and you look for a special addition to your collection. Caryota mitis is a plant that tolerates high air humidity. This is a quality that could be useful for certain places such as areas with water features or small interior ponds. 5. Codiaeum variegatum Garden Croton, a plant in red. 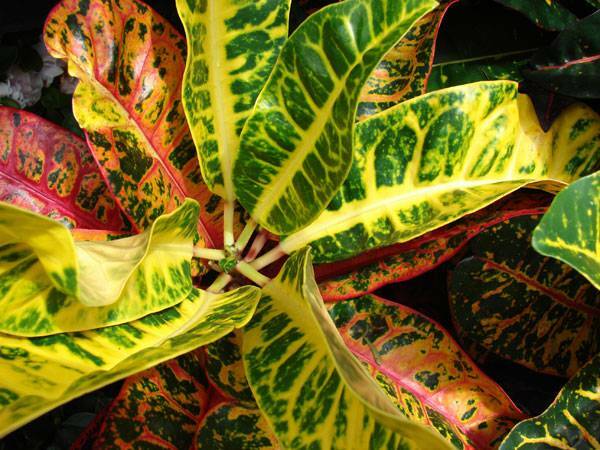 The most special characteristic of Garden Croton is its color. The spectacular red leaves could create an impact whether among other species or planted on its own. A beautiful way to incorporate this plant to your design is a cluster of three to five pieces, depending on the area available. The cluster should be placed among other plants. The darker the color of the adjacent planting, the greater the impact of the Garden Croton plants. The columnar, upright shape of Garden Croton allows also using it as an individual element, like a natural work of art. 6. Aloe vera True Aloe, the interior space cosmetic, Aloe vera is a succulent plant with light green, fleshy leaves. It is very well known for its use in the cosmetic and pharmaceutical fields. Unlike most plants, True Aloe absorbs carbon dioxide during the night, not during the day, which makes it a great plant for a cleaner atmosphere overnight. It requires little care and a very moderate amount of water to grow. Aloe vera is excellent for pot planting. See below how to take care of the plant and remove the baby leaves if you would like to pot them and create new plants. WATCH >>> Aloe Vera Plant Care – Removing Pups and leaves 7. Ferns A variety of beautiful choices. Ferns are the interior planting queens and it is very hard to distinguish which of the numerous fern species is the most popular. 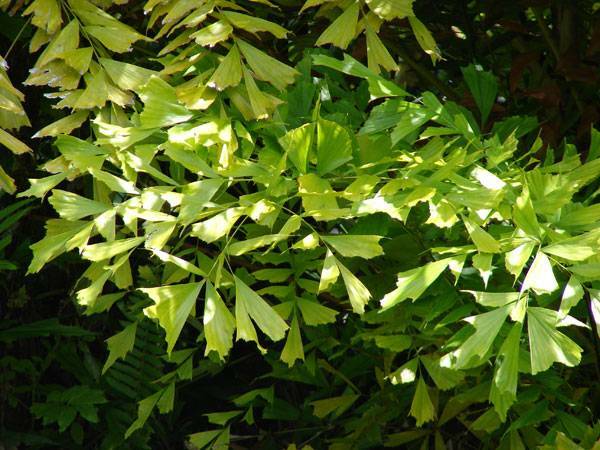 The feathery fern leaves present a variety of shapes in shades of light green. They never bear flowers, however they have a high aesthetic value and could work well on their own or combined with other species. 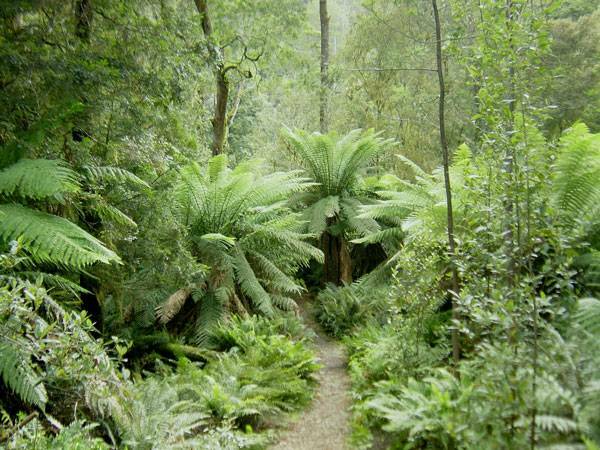 Ferns could form a dense understory vegetated area for taller plants such as Ficus benjamina. They require medium to bright light and moderate soil humidity to grow and provide a lush, vigorous planting. 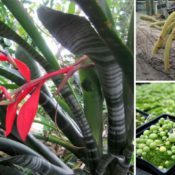 Among the numerous species, there should be suggested: Nephrolepis cordifolia, Microsorium musifolium, Platycerium bifurcatum. 8. Ficus Lyrata Fiddle-leaf fig Fiddle- leaf fig is a good option to create an interesting focal point in an indoor space. The foliage consists of wide, glossy and leathery leaves that make a big impact. The trunk, though strong, is very thin, which allows the foliage to become the main characteristic of Ficus lyrata. It requires high levels of luminosity so make sure there is plenty of light where installed. Fiddle- leaf fig is quite sensitive with the water amount it requires. There should not be either too little or too much water. 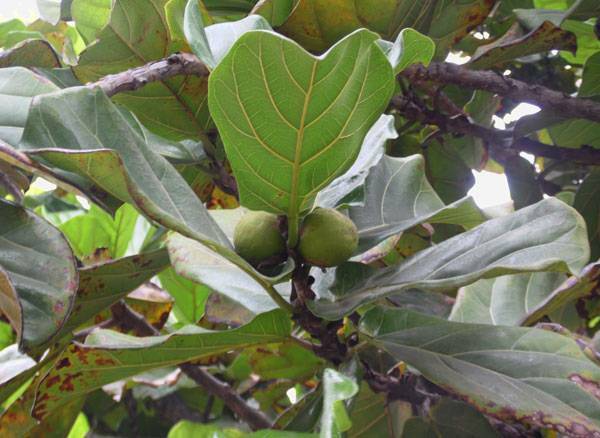 The plant appearance is affected immediately and it could start losing its leaves. 9. Alocasia macrorrhiza An Elephant Ear (Taro) in your room! 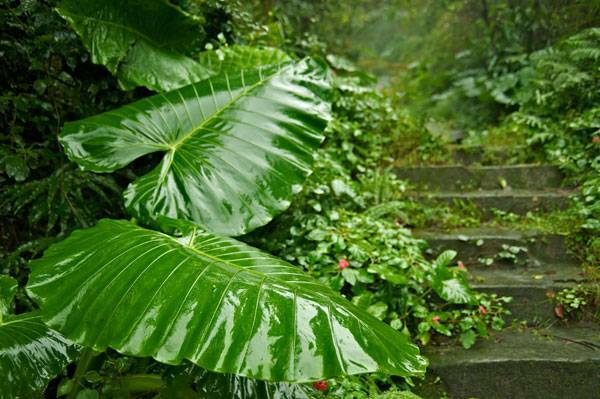 Alocasia macrorrhiza is a beautiful plant of large to very large size. The impressive leaves, formed in clusters, resemble an elephant’s ear, which has produced the plant’s common name. The leaf surface can reach an incredible size, which depends on the plant’s exposure to sunlight. It is adequate for planting in a pot but it is also combined well with other species such as Fatsia japonica, which comes next. Article by Eleni Tsirintani We take a look at 8 common mistakes people make in Interior Planting. Interior planting is perceived mostly as a different way to decorate and improve interior space. Well, it should not be thought of that way. Whether it is an arrangement of pots or a vegetated patio, interior planting represents a living system with needs and ways of its own that could contribute important benefits, both in terms of function and aesthetics in everyday life. What should one — professional or not — bear in mind in order to have a vigorous and beautifully vegetated space indoors? In this article, we discuss what to avoid when planting indoors, and thus provide a guide on what to do to succeed in such a scheme. The following mistakes when planting indoors concern both the phase of construction as well as further handling and maintenance. Mistake 1: People Do Not Do Any Interior Planting Confined spaces, lack of information, and limited free time leave the areas where we spend a good portion of our life deprived of plants and the benefits they could offer. 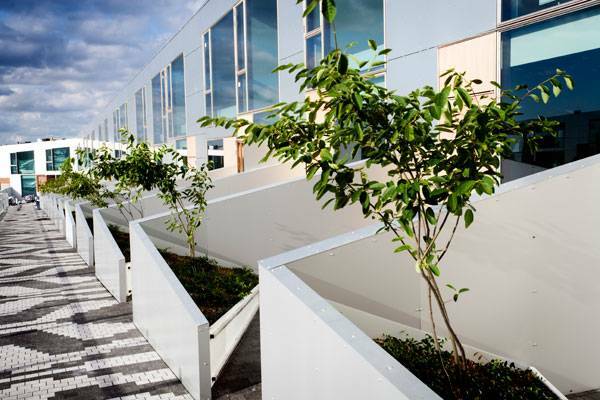 Contemporary architecture works toward a more sustainable and ecological approach, and it attempts to incorporate planting to the creative process. New technologies offer the means to create beautifully vegetated spaces no matter what the conditions are. So there is only one thing to be done: Go for it! 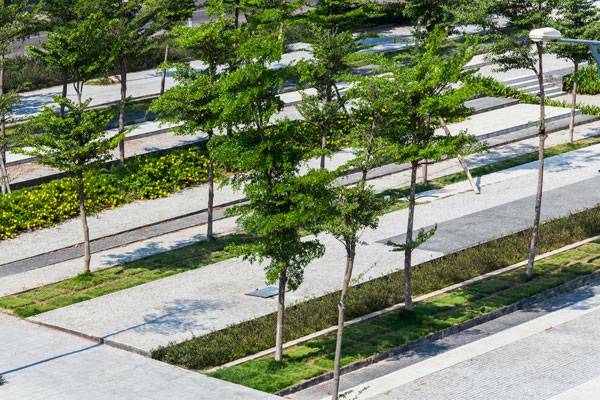 There is always a “trial and error” period, but it could prove extremely beneficial and create a new field for interior landscape architecture to evolve. Mistake 2: Wrong Plant Selection We could never expect a palm tree to thrive in Antarctica. Why should every plant grow indoors? Site specificity is a “must” when planting in an interior space. The characteristics of plants that could actually grow in an interior space are the following: a. Moderate to low light needs – This is evident since no artificial illumination could actually match the intensity of sunlight. b. A “disciplined” root system – Plants with growing and expanding root systems won’t thrive in the confined space of a container or a built planter. They could actually cause problems, such as wall penetration, that are hard to control and handle. Such issues could be easily avoided by simply choosing the right plant. c. Low Humidity Tolerance – The air in interior spaces is low in humidity, and sometimes it proves too dry even for people. Plants should be resilient to low humidity in order to adapt and perform well in the specific environment. Watering during winter should be increased indoors. This is important because heating causes low humidity levels and soil becomes dry more frequently. We would never consider this when it comes to planting outdoors. Provide ventilation all year round. Would you ever think of providing plants with fresh air? Well, you should if they are enclosed in a room. Clean those leaves. The benefits of rain for plants go beyond just watering them – rain also keeps them clean. When it comes to indoor planting, this is something we have to do ourselves. 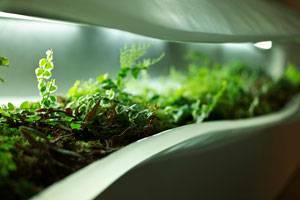 Planting indoors could become a new exciting field for design and experimentation. 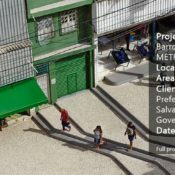 Article by Eleni Tsirintani We review how a slope was used in the Ladeira da Barroquinha project by METRO ARQUITETOS, Salvador, Brazil. Landscape projects tackle two fundamental states of being; motion and stillness. They usually focus on balancing between these two opposite conditions. However, there are projects that are enjoyed and appreciated only through the act of moving through them. 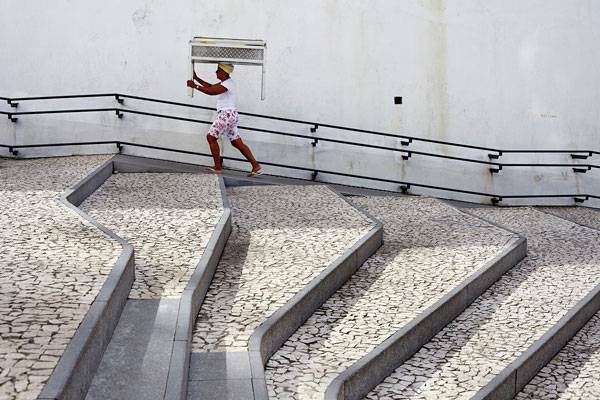 Ladeira da Barroquinha is an efficiently designed pedestrian access in the center of Salvador that embraces human motion and forms a new narrative for walking in the city. Salvador is the capital of Bahia, a large region of Brazil. The sea’s proximity and a unique topography are principal elements of the city. Salvador is a colorful, vibrant city, that preserves, alive, the signs of its past as a Portuguese colony. 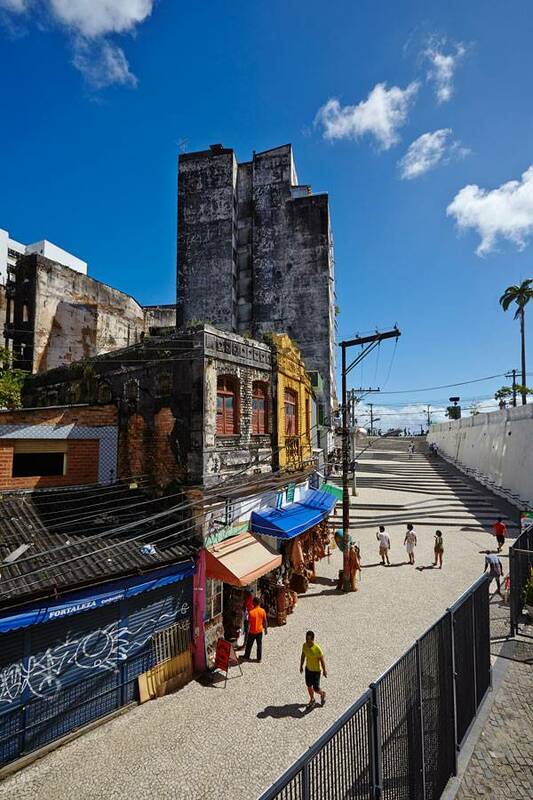 Salvador de Bahia is an eminent example of Renaissance urban structuring adapted to a colonial site according to UNESCO. Therefore it has been included in the World Heritage List. 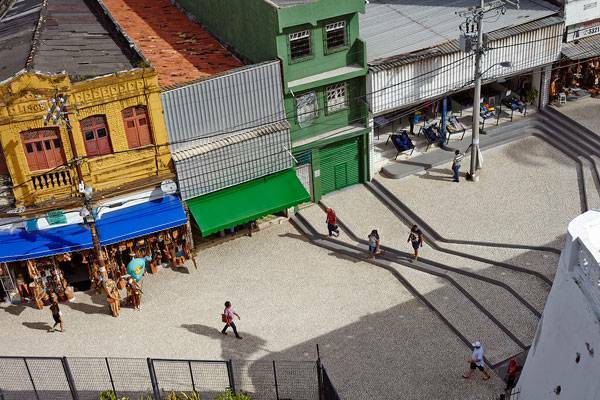 Small- and grand-scale buildings form the existing urban tissue in Salvador’s center. They give a sense of dispersion and fragmentation that inevitably is reflected in the public spaces, as well. 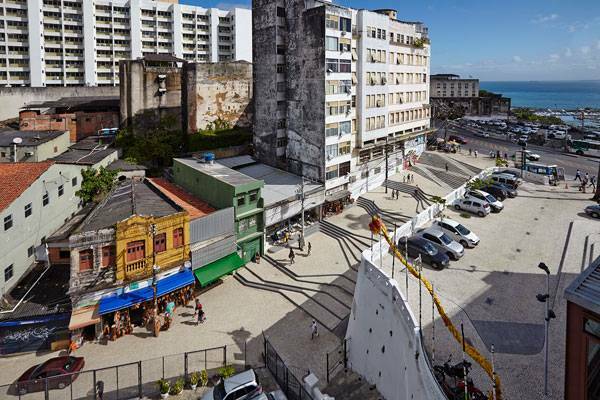 The Brazilian office, Metro Arquitetos, were assigned the new design of Ladeira da Barroquinha in order to connect the public space renovations for the Glauber Rocha Theatre and the Gregorio de Mattos Foundation cultural area based at Barroquinha Church. 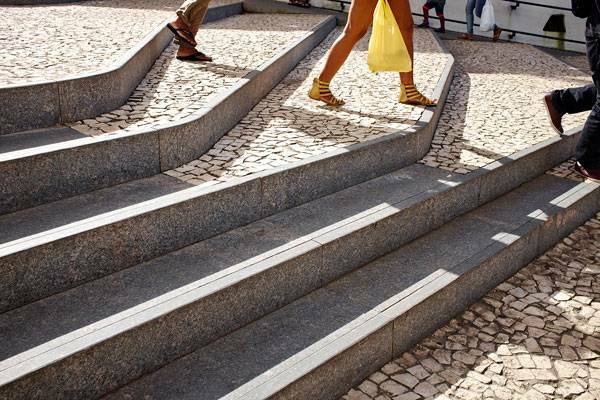 Reinventing the Slope “Ladeira” means, in Portuguese, “Slope”. 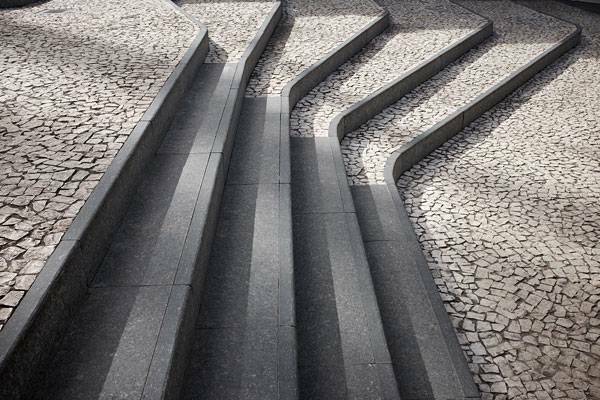 The project functions as a link between the newly designed public spaces and, at the same time, organizes the entrances to the buildings that face the slope at different levels. 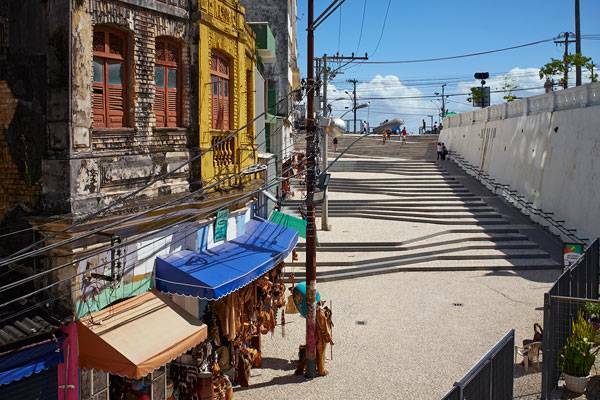 There are both shop and residence entrances that unravel along the “Ladeira”. All had to be accommodated with the proper access and outdoor space. The topography has been modified into terraces of varying widths. The terraces are formed like waves that expand toward the lower level of the site. 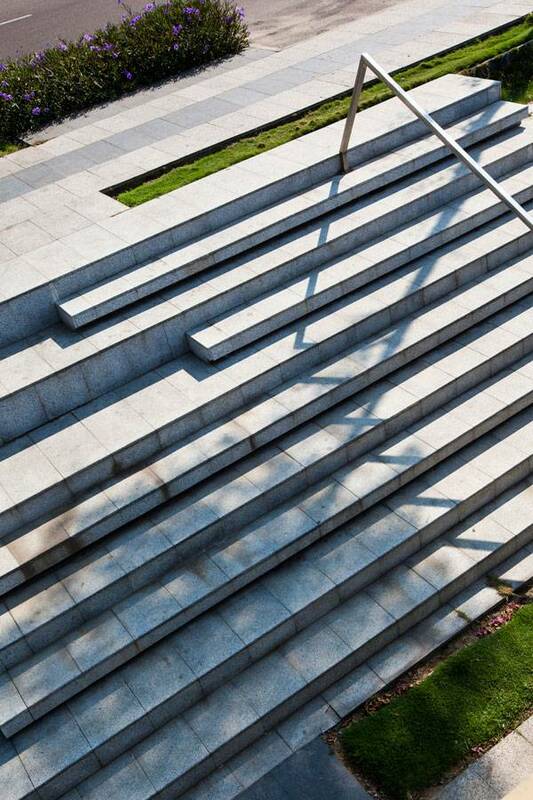 The ramp for wheelchairs unfolds across the adjacent retaining wall and it is gradually integrated into the stairs in the higher part of the project. New paths with different speeds and open plateaus for permanency are created. In addition to the slope itself, which is used exclusively for pedestrian circulation, the project expands toward the square next to the cinema, located at a higher-level plateau, using the same design principles. 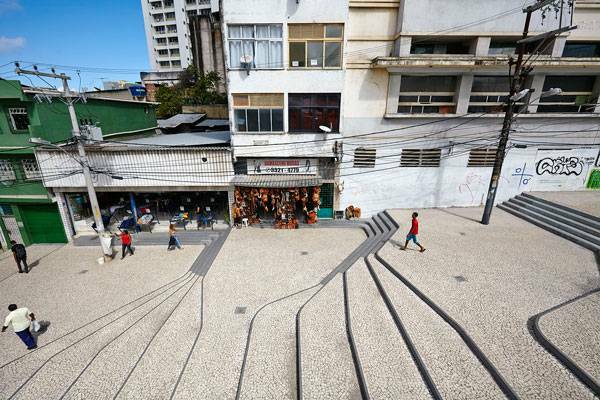 Original Use of Traditional Materials All materials used on the project are found already on the streets of Salvador; however, the innovative design has shed a new light onto their application in public space. The terraces have been constructed with ceramic tiles. This is a reference to the Portuguese tradition in Salvador. The city used to be the first capital of Brazil from 1549 to 1763. Modern techniques, however, like water jet cutting, allowed the traditional tiles to be shaped into a new form with rounded edges and multi-angular shapes. The terrace edging and the sitting benches are made of grey granite. Ladeira da Barroquinha: Quality Variations The project appears to have many features to examine and become inspired by.It combines a variety of walking expressions; the high speed walking of those who hurry to catch the bus in the nearby terminal, the slow motion of people who go shopping, the relaxed passes of visitors and tourists. Combining different walking speeds in a single design gesture is a demanding and complex task. The act of moving in the city has a number of design challenges; one can research these in the book “Street Design: The Secret to Great Cities and Towns” presented in LAN book reviews. The project tackles the dispersion and the fragmentation of its context. It values and respects the existing elements such as the small shops and the narrow entrances, and accommodates their needs with care and precision. The material application in such a dispersed space has been creative and imaginative. The simplicity of the selection; ceramic tiles and granite, combined with their innovative elaboration, create a coherent and beautiful result. Obviously, opting for the best kind of paving is not a trivial matter. Everything you need to know regarding paving and how to avoid possible mistakes is covered in the article : “8 Common Mistakes People Make When Specifying Paving, and How to Avoid Them” This should be one of the very few landscape projects where the total absence of vegetation is not a disadvantage or an omission. There seems to be no need for any plants and that is also part of the project’s success. 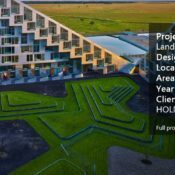 Article by Eleni Tsirintani 8 House and Landscape Design, by BIG | Bjarke Ingels Group, in Copenhagen, Denmark. The architects have designed a neighborhood in horizontal layers, like a built cake, as they put it in their presentation. The distinct layers diversify and intersect according to the program and the functional demands. The massive scale of the intervention questions the boundaries between building and urban planning. The diversity of spatial experiences, the combination of functions and the great importance given to sustainability are only few of the project’s merits. 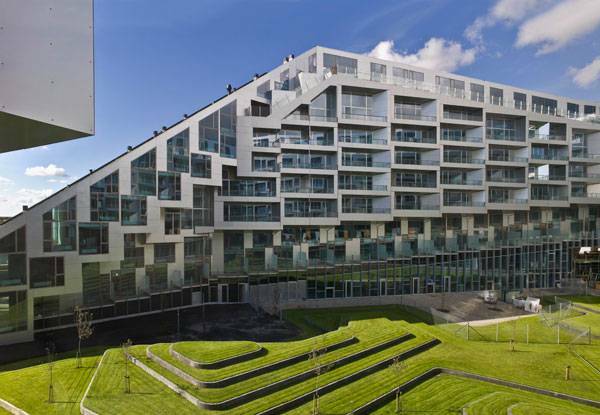 8 House: A Gordian Knot in Copenhagen The project is located in the outer edge of the city in the area of Orestad, in Copenhagen. 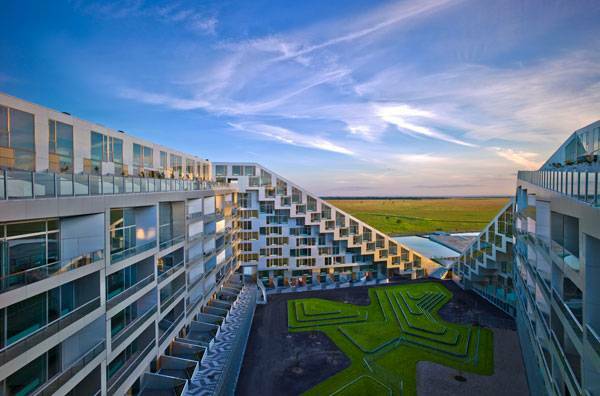 It is the largest private development ever undertaken in Denmark. The complex accommodates dwelling, retail, and offices in all three dimensions. It creates a contemporary, vivid neighborhood in both horizontal and vertical levels, which is the project’s great success. 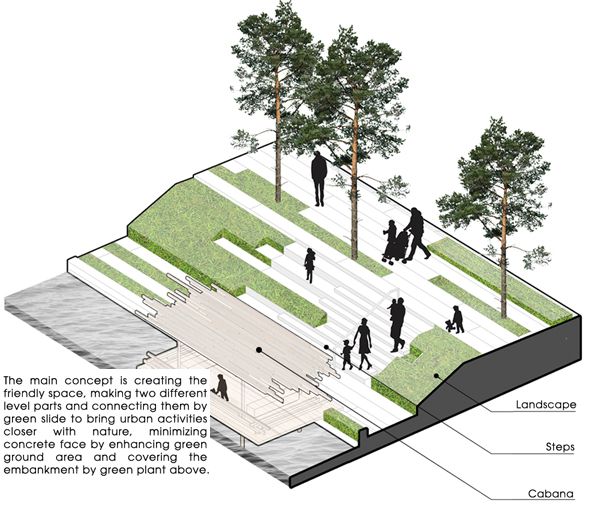 The landscape design of the project extends from small private gardens to sloped green roofs to public plazas. The adjacent water canal enhances the total landscape diversity. 8 House is a condensed experience of many landscape variations. 8 House Ground Level The project masterplan included a direct passage from Amager Common, a green area which offers plenty of opportunities for outdoor activities, to Hein Heinsen’s Square. The two public spaces are connected with a nine-meter-wide passage that crosses through the 8 House. This passage created the need to tie the building complex like a knot and form the number 8. The design gesture immediately created four different open spaces. The Patio on the North side has acquired an organic topography, covered with lawn. On the other hand, the Patio on the South side is made of lawn terraces that create a low geometric hill and it includes functions like seating areas and playground fields. The different designs of the two patios derive from the proximity of the latter to the water canal and the access towards it on the southeast side. The design gently guides the gaze and the steps towards the passage to the water. The North patio, on the other hand, is a landscape in the traditional sense. It is a place to look at. Being in the open space is not encouraged due to the surrounding functions; there are only commercial spaces and offices on the ground floor. The two triangular plazas on the east and west side are covered with cobbles and form a transition zone between the adjacent streets and the building. Rows of upright, deciduous trees unfold along the East and South façades of the complex, indicating the way towards the canal. 8 House Floors The 8 House dwellings have been located on the first floor and above. This decision was made in order to take maximum advantage of the daylight and to ensure privacy and safety. Along the exterior part of the complex, a wide, open-air passage serves to connect the dwellings. It bears the characteristics of a typical pedestrian street access in terms of scale, vegetation, and interaction with the private gardens. It functions as an intermediate space between the domestic garden and the city. 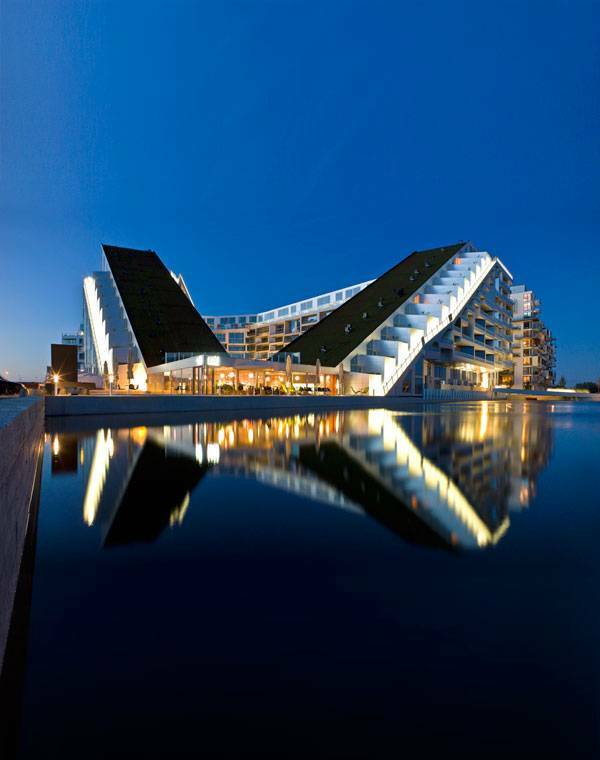 The inspiration came from a well-known Copenhagen neighborhood “Kartoffelrækkerne” according to the architects. The whole complex is surrounded by this pedestrian access that wraps the building like a band and makes all dwellings completely accessible. 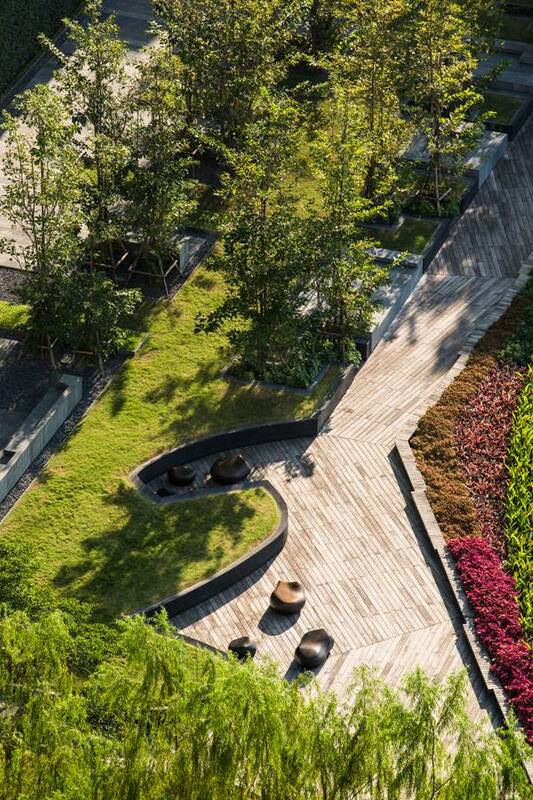 In each private garden, a triangular, elevated planter creates the boundary between the different spaces. A small ornamental tree has been planted in every planter, creating a sense of repetition and consistency to the façade. Apart from that there is freedom for personal expression and adjustments to each individual space. 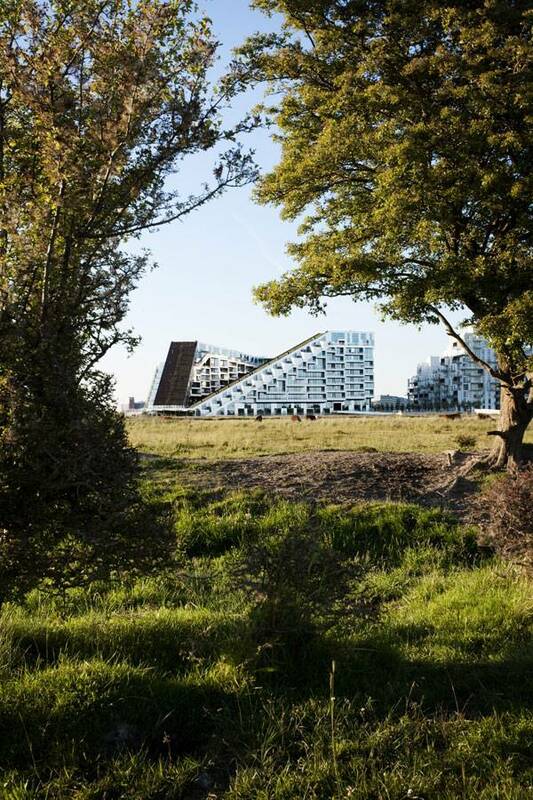 8 House Green Roofs In order to open up the Southwest patio and the apartments towards Amager Common, the designers have lowered the southeast edge of the building. 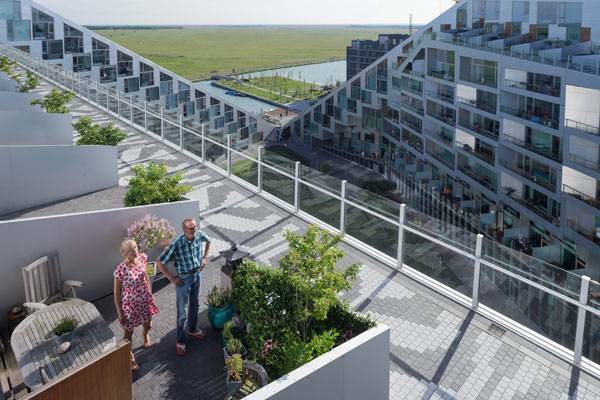 This gesture allows the afternoon sun into the patio and creates two large sloped green roofs on the two sides. Sloped green roofs are a feat of technology and required a very demanding type of construction. The correct selection and application of the built-up area is crucial to retain the planting substrate and allow plants to grow on it. A Magic Number in the Outskirts of Copenhagen 8 House is a strong indication regarding the future of architecture and landscape architecture. The boundaries have started to merge. Building and landscape integrate into each other creating a strong and unique entity. One would ask: Is this the end of the different disciplines? 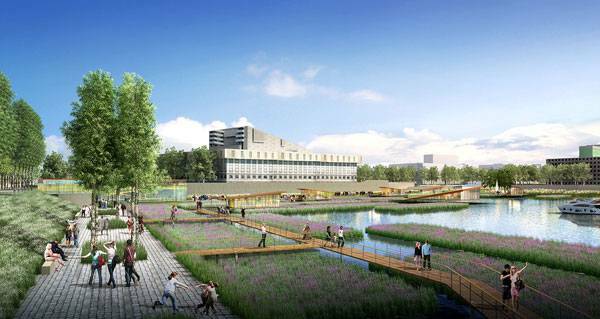 Will there not be a distinction between architecture and landscape architecture anymore? Article by Eleni Tsirintani. 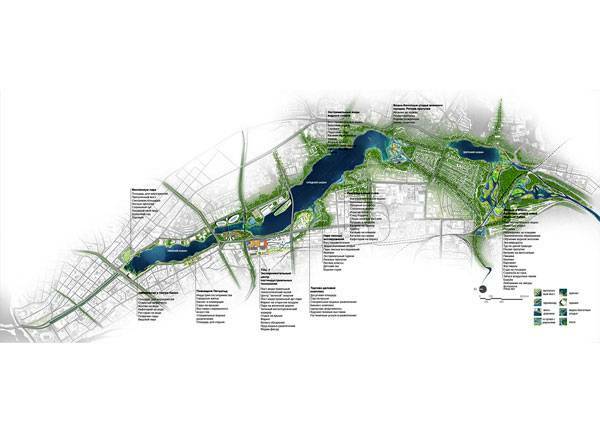 The Resilient Ribbon, by Turenscape + MAP architects, in City of Kazan, Tatarstan, Russia. Water is life, as cliché as that sounds. 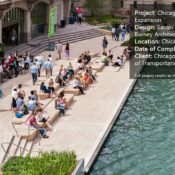 Landscape architecture projects value and include water to improve, enrich and develop a territory. However, producing a new mythology around water through which one might comprehend and design an area is a very original concept that deserves further and more detailed exploration. Turenscape and MAP architects have won first prize in the international competition for the development of the Kaban Lake System Embankments by shedding a new light on the water surfaces of the lake and treating them as a treasure that has just been found! 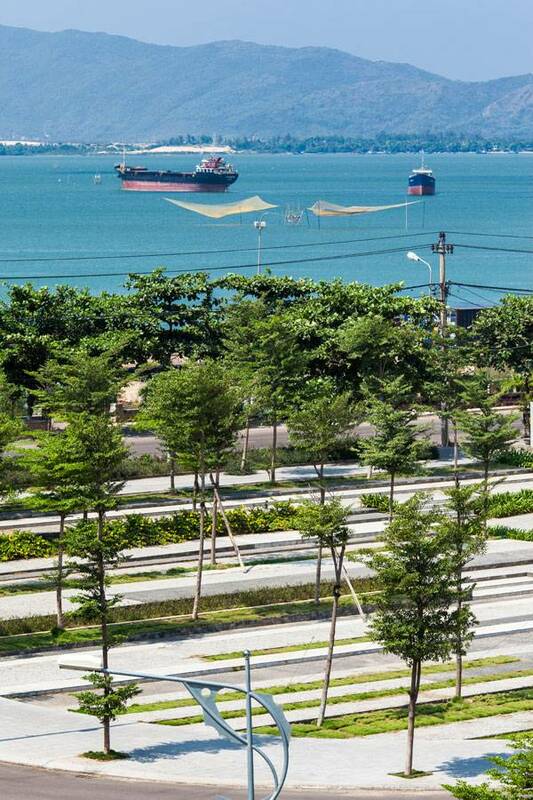 Turenscape landscape practice is well-known for their special approach towards large scale landscape projects and their persistence and commitment to sustainability. 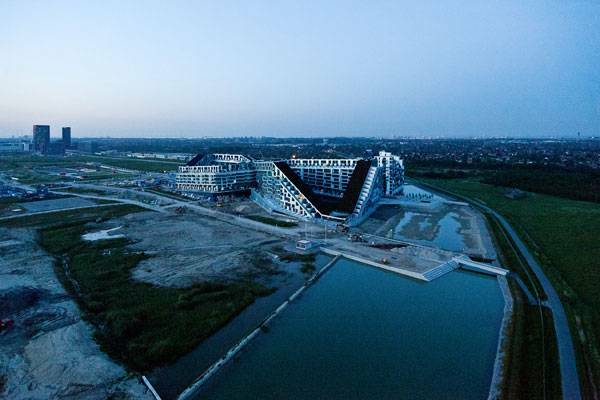 Their project in Quzhou Luming Park is one of the numerous examples of their professional philosophy. 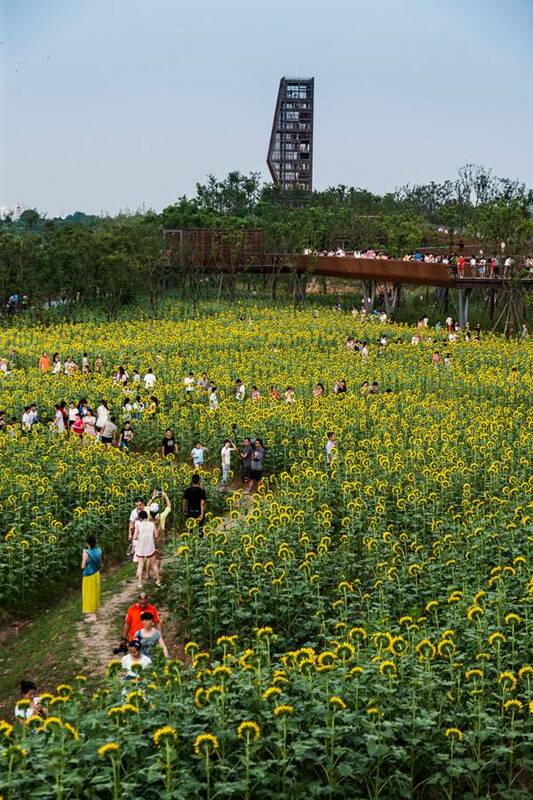 The project is presented in the LAN review: “Quzhou Luming Park Proves that Natural Processes Offer the Most Sustainable Solutions“ by Erin Tharp. Quzhou Luming Park. Photos courtesy of Turenscape. 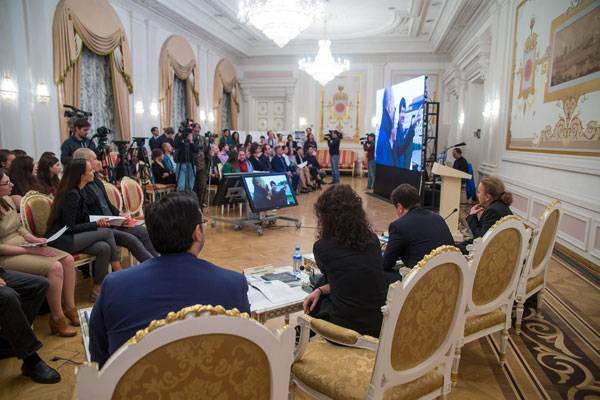 The authority of the Republic of Tatarstan Government held the open, two-phase competition from June 18th to September 30th, 2015. The competition was an initiative of the Temporary Acting President of the Republic of Tatarstan; Rustam Minnikhanov. It tackled the full reconstruction of lake embankments in the center of Kazan, turning them into vibrant, contemporary public spaces. 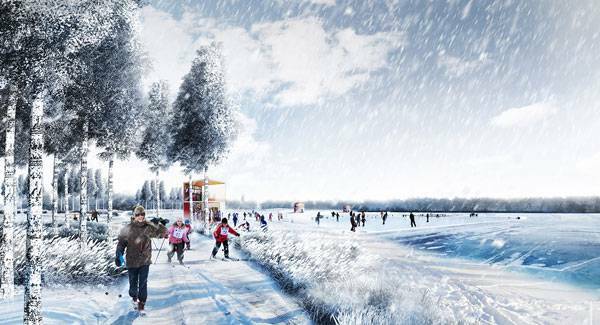 The Chinese-Russian consortium of Turenscape and MAP architects, a Moscow-based architectural firm, won first prize and will further develop their masterplan towards the reformation of Kaban Lake complex. Turenscape and MAP architects’ design was selected as the winning scheme from 10 international finalists in the 2nd stage, which were selected out of 170 applications from 18 countries during the 1st stage on July 7th, 2015. Kazan is the capital of the Republic of Tatarstan and one of the largest and most beautiful cities of Russia. The city is included to the list of UNESCO World Heritage Cities. Kaban Lake lies in the city of Kazan and it defines the city character to an extended degree. Kaban Lake actually consists of three distinct parts; lower or nearer Kaban Lake has a total surface area 56 ha, while middle or further Kaban Lake is the largest of all three parts. The width of middle Kaban Lake varies from 170m up to 580m. Upper Kaban Lake does not connect naturally with lower and middle Kaban and it is the smallest of the three with only 25 ha water surface area. All three lakes connect with water channels. 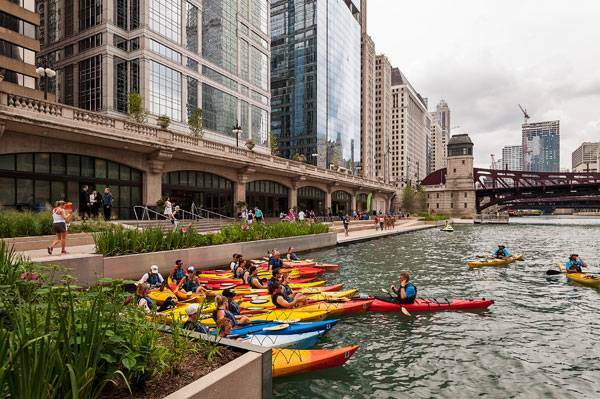 The natural and cultural interaction between the city and the lake is vital. Many historical legends refer to Kazan Lake Complex including one that refers to treasures in the lakebed waiting to be discovered. This was the key element of the winning design. The design team thought that water is not a treasure case as the myth puts it; rather it is the treasure itself. Their proposal, titled “The Resilient Ribbon”, is perceived as an elastic band that materializes the Immortal Treasure of Kazan. The open competition regarding Kazan Lake Complex is part of a wider development process that includes all of Tatarstan. 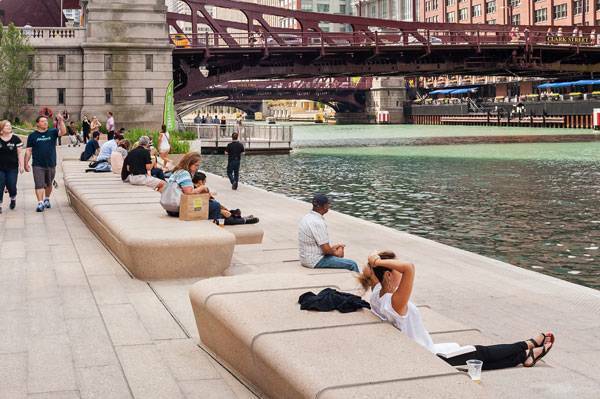 The country is changing its whole approach toward public spaces. The year 2015 was announced as the year of parks and squares in Tatarstan; year 2016 will be the year of nature reserve water areas. The program was implemented by Assistant to the President of the Republic of Tatarstan, Natalia Fishman. The project regarding Kaban Lake is scheduled to begin in 2016. The ecological band will become the link for the vegetated surfaces and it articulates them through a system of water purification management. The aim is to protect and strengthen the ecological diversity. The cultural band pays tribute to local heritage by developing many functions and activities along the lakeside. It takes into account the relevant existing elements and forms a new background to unite and highlight them. The low-speed transport band improves the existing public transport system and emphasizes the use of bicycles along the water. The new transport arrangement will facilitate access for both residents and visitors to Kaban Lake. The Master Plan includes all three Lakes of Kazan. 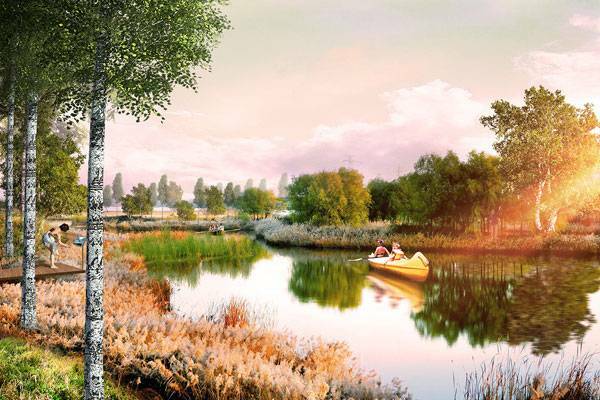 However, as per the competition rules, lower Kazan Lake has been further developed in order to make the design concept more explicit and clear. The lower Kaban Lake Master Plan presents a number of activities and landscape qualities that unravel along the lakeside. An existing fountain on the north side becomes the welcome element of the park entrance. The lawn area around the fountain is accessible through a wide, curved hangar. 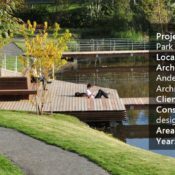 A ribbon that revolves around the lawn and reaches over the water surface serves as a viewing area towards the city and the lake. The northeast part of the lake is flanked by a canopy of trees that develop along rectangular water ponds. Numerous floating islands – restaurants and cafes on platforms over the water surface – create points of interest and penetrate the boundary between land and water. Wooden platforms for walking and extended bikeways make the area accessible and link the succession of vegetated spaces. Piers for small boats accommodate the already existing sport activity, especially rowing which is very popular among the citizens of Kazan. Other interesting interventions regarding water are presented in the book “Water Urbanisms East”. 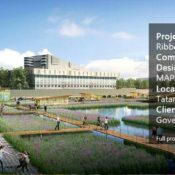 The Resilient Ribbon Project has taken something that was already there and worked on its reinvention. It handles water and all of its possibilities to create new, interesting spaces and blow a wind of change on the city of Kazan. Understanding landscape as a field of undeveloped possibilities and framing a change in the dominant perception or the established conception of a territory is without any doubt what landscape architecture is about: transformation. What do you think of this winning competition entry? Let us know in the comments below! Go to comments If you would like to keep up to date with the latest competitions from around the world, make sure you sign up for our VIP Club. Click Here! 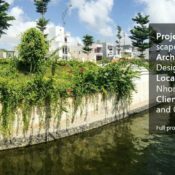 Article by Eleni Tsirintani Dong Da Lake-scape, by Mia Design Studio, in Thi Nai Ward, Qui Nhon City, Vietnam. Infrastructure and recreation are two functions that are not combined, at least most of the time. 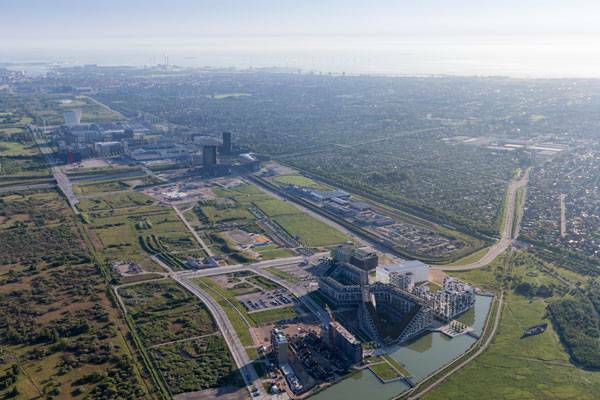 Given the limited space in contemporary cities and the constantly increasing need for projects that improve urban life such as drainage, sewage, and anti-flooding systems, this notion has to change. 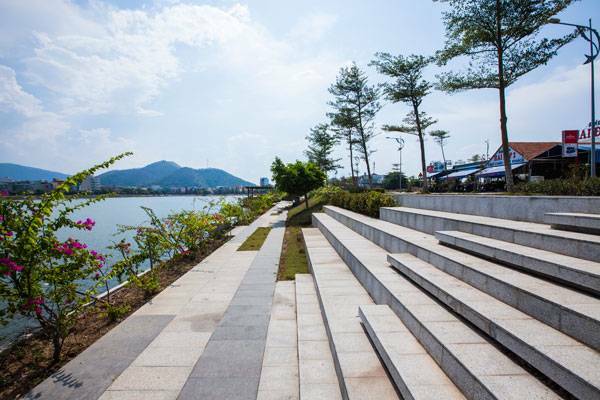 Dong Da lakeside project combines a new sewage system and a vivid linear park along the northeast bank of Dong Da lake. 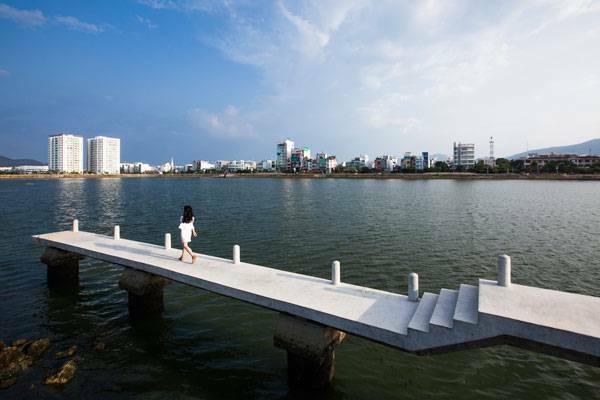 The intervention unravels along a narrow strip of land between the lake and the Thi Nai lagoon. The sewage system prevents lake overflow and protects the adjacent building blocks. 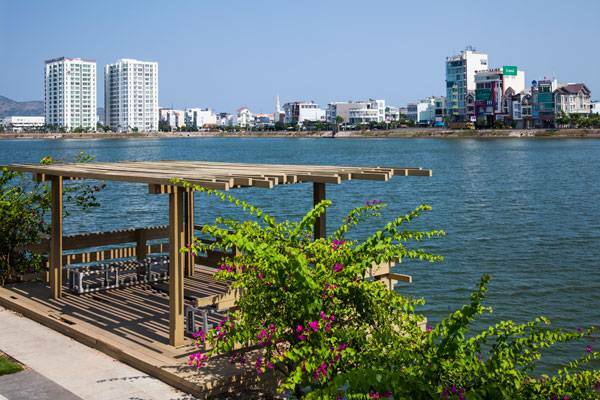 The park has become a popular place for both residents and tourists that would like to enjoy visiting a high quality urban space in contemporary Vietnam. Dong Da ecological lake used to work as a refugee port for fishermens’ boats in the neighborhood during severe storms, 10 years ago. There was a boat yard and temporary slums that had been moved from nearby regions. The current project location had become a rather neglected and abandoned place. The poor state of the slums and the inefficiency of the sewage system that flowed directly into the lake have critically damaged and polluted the Dong Da lake ecosystem. Consolidation and embellishment of the area became an emergency. 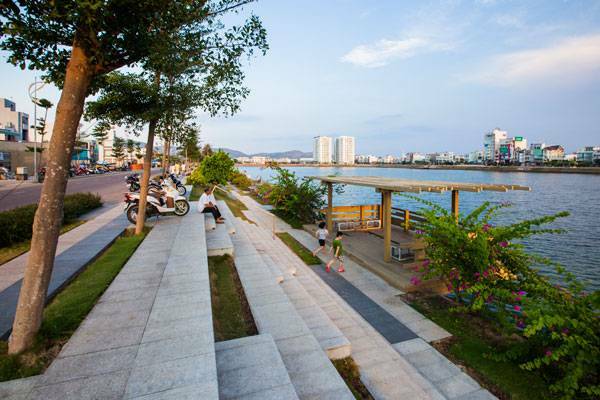 Mia Design Studio has worked on the development of a new recreational area, taking into account the importance of preserving and protecting the new sewage system. The design and construction process, which involved both landscape and regional planning, lasted 18 months. The park unfolds along the river side offering the visitor different, interesting points to explore. The new intervention has been connected to the preexisting landscape project on the northwest side. 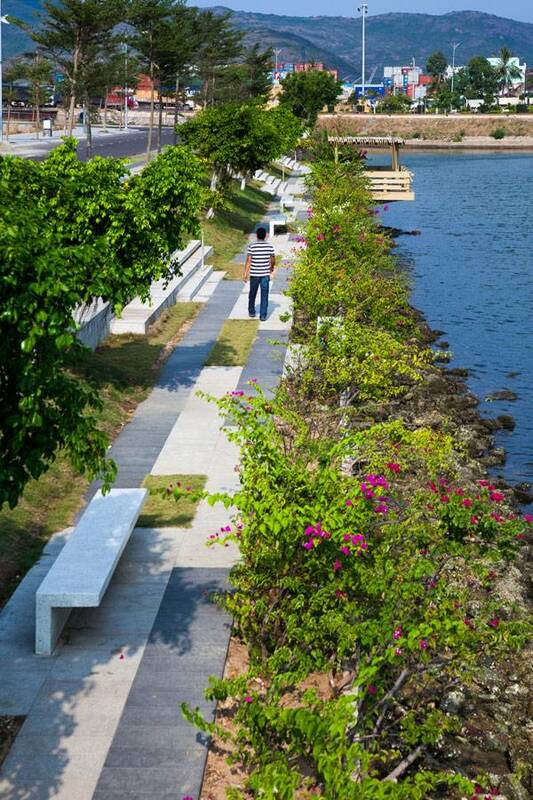 A wide surface across the road has been transformed according to the lake-side design. This gesture forms a sort of entrance/transition towards the project. Wide stripes of vegetation and linear rows of trees shade the stone paths along the bank. A curved pier penetrates the linearity of the bank and invites the visitor to cross the river edge and stand right above the lake. The narrow width of the pier creates a sense of suspension over the water. This seems to be one of the most popular spots, especially for young people. Towards the east side there is a succession of wide, terraced sitting areas that function as view and meeting points. Rows of spiny bucida (Bucida molineti) shade the area and separate it from the adjacent road. In the central part of the site, the design geometry becomes more strict and rigid. Three wooden, sheltered constructions have been placed right on the water edge to allow for rest and relaxation near the lake. Along the east edge of the project, trees become fewer. Clear surfaces covered with lawn, shrubs and bushy bougainvillea form a different, more colorful landscape. The intervention ends at the central vehicular access. A wide, triangular terraced zone spreads like a hand-held fan along the edge. This zone protects the park from vehicular movement and the inevitable noise and creates a different view point as well as a space where collective activities could take place. The spatial qualities of the project Dong Da Lake-scape are very important. Despite the narrow width of the intervention site, the space is coherent and allows for plenty of outside activities to develop. 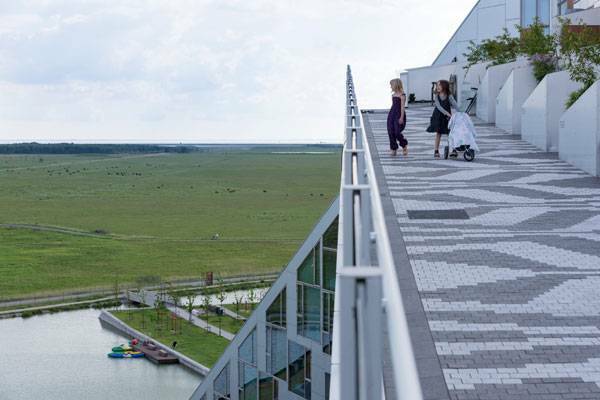 The design takes advantage of the sloped surface and forms escalated spaces and terraces that allow water proximity, reveal beautiful views towards the city and the lake, and encourage meeting and playing. The equilibrium between softscape and hardscape has been very well balanced in the project. The narrow planting beds interact with the concrete and stone paving slabs and stairs. Vegetation and circulation unite to introduce a different landscape model. 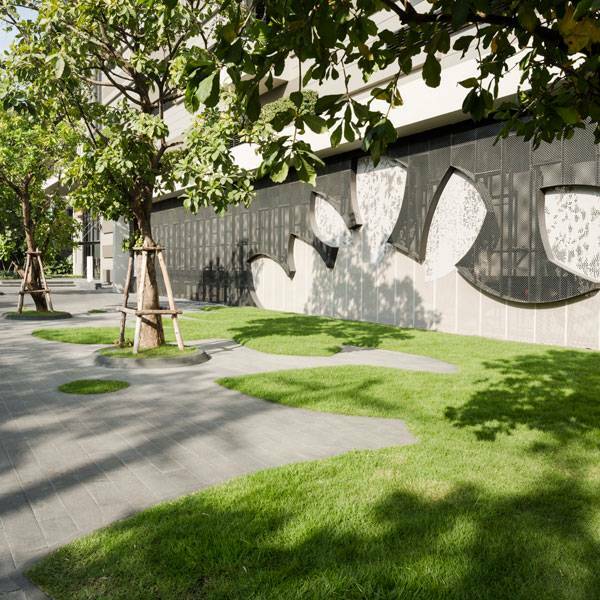 A similar design approach could be observed in the article – Urban Jungle Created to Perfection by Agence TER The integration of planting into the hardscape blurs the boundary between the two, without dismissing the sense of geometry and design integrity. 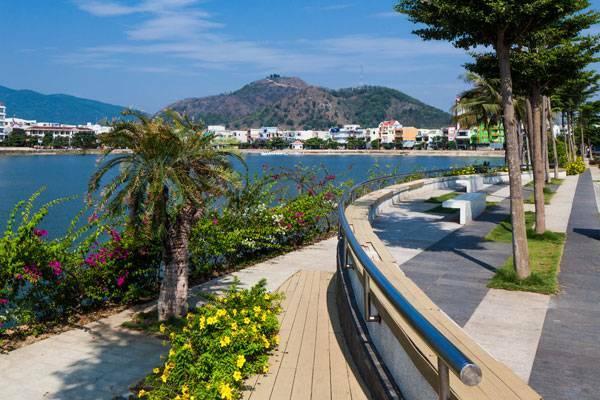 Dong Da Lake-scape is one of those projects currently being developed in Vietnam that makes the country an important destination for tourists. It also functions towards the development of a new mentality regarding the environment and its protection. On a social level it tries to strengthen the sense of community and the importance of spending time outdoors in high quality public spaces. A development that shares similar values has been presented in the article – Extraordinary Development Re-connects City with the River Bank. 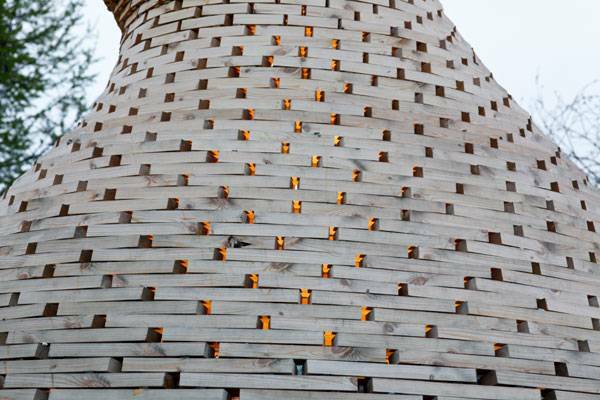 A Fireplace for Children, by Haugen Zohar Arkitekter, in Skjermveien Kindergarten, Trondheim, Norway. Landscape architecture is usually associated with grand scale. Landscape design signifies decisions that may have implications on an urban or even territorial level. However, there are small landscape projects or rather, installations, which function like gentle gestures to enhance outdoor, spatial experience. A small cabin in the town of Trondheim in Norway belongs to this type of project. 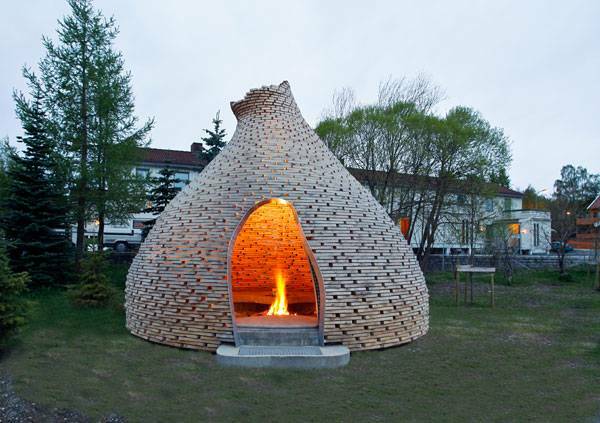 The structure serves as a sheltered fireplace for children. It complements the playground equipment that already exists on the site. It is used for playing, storytelling and enjoying being near the fire. The tight project budget did not allow for any luxuries. The short wooden pieces that form the surrounding “shell” have been collected from a construction site nearby. Eighty layered circles of various diameters create a whimsical form. The whole structure has been placed on a concrete base. 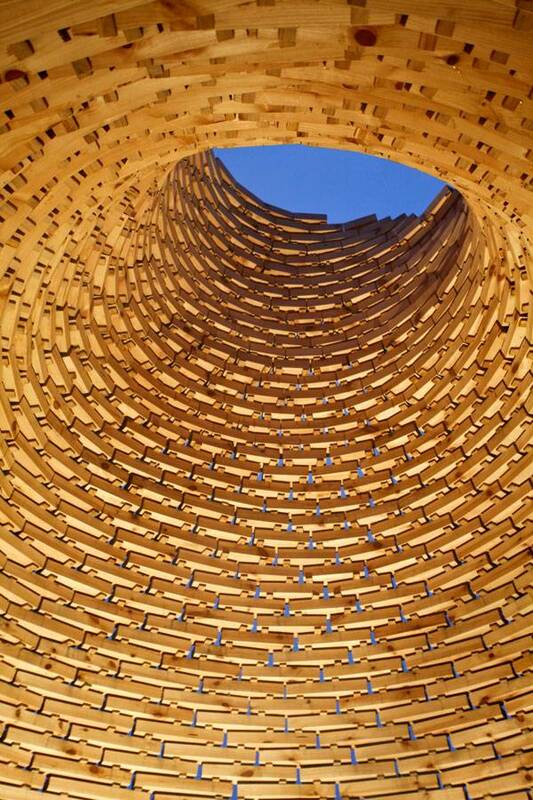 Every circle is made out of 28 pieces of a naturally impregnated core of pine which are placed with varied spaces to assure air circulation and natural light. The structure ends in an opening that works as a chimney. The fire is set in the center allowing for everyone to gather around it. A double curved sliding door was designed for locking the structure. There is a sense of motion that gives the installation an artistic quality. One could think of Cornelia Konrad’s land art projects. Her structures defy gravity and seem to elevate towards the sky like they are preparing to dissolve. You can take a closer look to Land Art Masterpieces in the LAN article: 10 Top Examples of Land Art from Around the World” by Paul McAtomney. The Norwegian turf houses called, “Goahti” are a beautiful example of how to live in harmony with nature. All materials used for this type of construction are found locally. The vegetation that ravels the wooden structure ensures its protection and insulation. 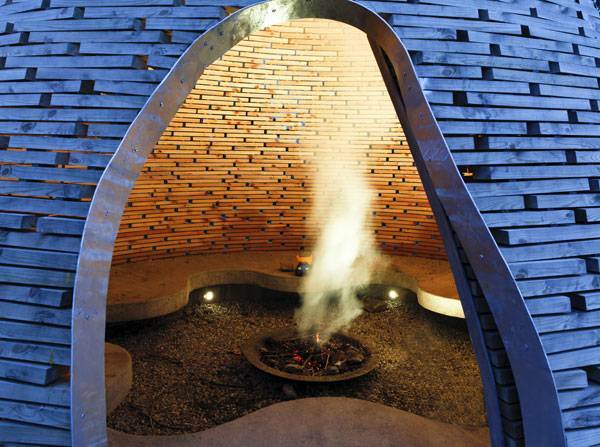 The Fireplace for Children pays tribute to the “Goahti” in terms of shape and construction philosophy. However, it maintains its contemporary character. The wooden pieces that shape the Fireplace have been put together so as to allow light and air circulation in the interior of the installation. They also allow a few glimpses out towards the surrounding landscape and connect the interior of the installation with the external environment. The traditional Norwegian technique of wood construction and handling produce elaborate yet effective and attractive joints. 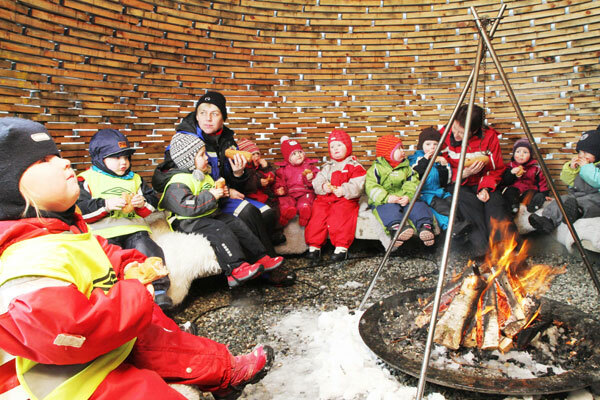 Though the Fireplace for Children in Trondheim does not connect directly to the traditional approach, it certainly could be interpreted as an evolution in the field of traditional log joinery.